The public is invited to “Got Wealth? Let’s Get Your House in Order!” on April 27 from 11AM to 1PM at the East Cobb Government Center. 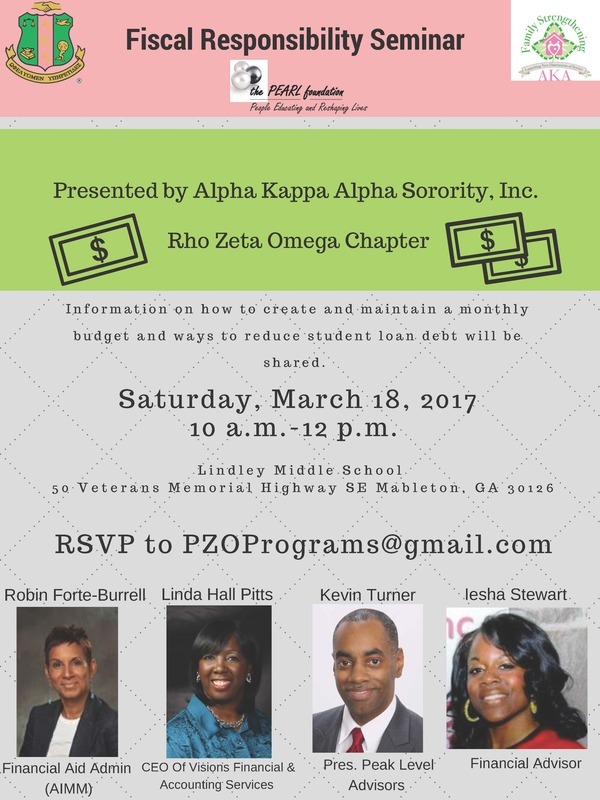 This free workshop is hosted by the Rho Zeta Omega chapter of Alpha Kappa Alpha Sorority, Inc. in conjunction with The PEARL Foundation, Inc. The program will be divided into two parts. First, Ashley Karim-Kincey will share her expertise as a Realtor and provide guidance on how to purchase a home. Second, investors Drew andAshley Dixon will share information on purchasing real estate as a way to accumulate wealth. This program is a tenet of “Building Your Economic Legacy,” one of the sorority’s international program targets for 2018-2022. AKA chapters across the globe are developing community programs designed to emphasize financial planning, asset accumulation, and wealth building. credit repair and monitoring workshop on March 30. Financial operations analyst Undriss Miller, MBA, provided an interactive learning experience and educated everyone on best practices for personal finance. This event is free and open to the public. Lunch will be available; registration is highly encouraged. East Cobb Government Center is located at 4400 Lower Roswell Road, Marietta, GA 30068. For more information and to register, visit Eventbrite.com or visit akarhozetaomega.org. AlphaKappaAlpha Sorority,Inc.is the first Greek-letter organization founded by African-American women at Howard University in 1908. Led by our now 30th president, Glenda Baskin Glover, Alpha Kappa Alpha is a sisterhood of national and international stature. Its members share the same high moral, ethical, scholastic, and spiritual standards; and are leaders in their community – inspiring, serving, and empowering all with whom they come in contact, while addressing the social and economic ills of our society. For more information about Alpha Kappa Alpha Sorority, Inc., visit www.aka1908.com or www.akarhozetaomega.org. 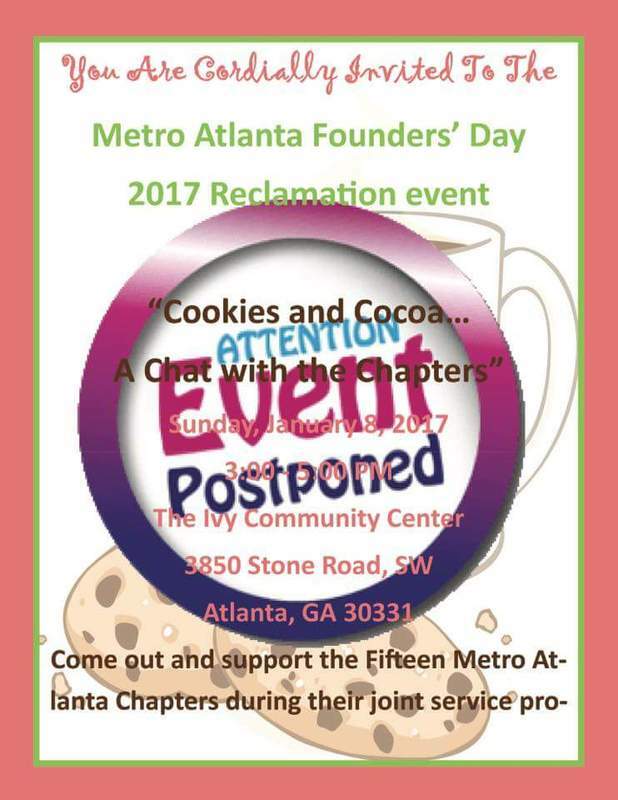 (MARIETTA) Feb. 20, 2019 – The Rho Zeta Omega Chapter of Alpha Kappa Alpha Sorority, Inc. is one of four local service-based groups who are co-sponsoring the 11th Annual Women’s History Day. This panel discussion is March 2 from 9:30-noon at Chattahoochee Technical College North (5198 Ross Road, Acworth, GA 30102). This year’s theme is “Unpacking the Briefcase: Women Leaders, So Now What!” A panel of local leaders from varying backgrounds will discuss how females can face today’s societal problems using education, experience and empathy. The panel will be moderated by Shelley Elder. She is the 2017 Cobb County recipient of the Sam Olens Award for Charitable Giving, 2018 recipient of the Cobb County Citizen of the Year for Kennesaw, and Kennesaw’s 2018 Business of the Year. 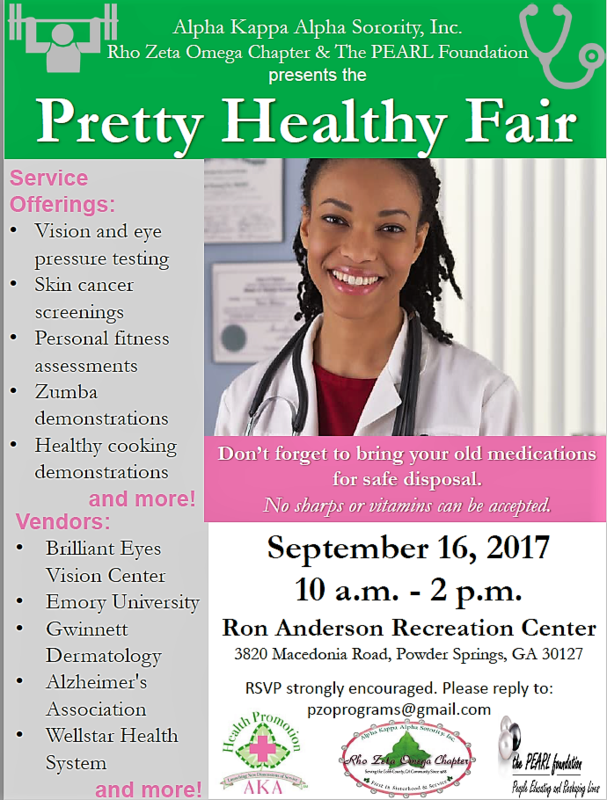 Event sponsors include the Rho Zeta Omega chapter of Alpha Kappa Alpha Sorority, Inc., Cobb County Women’s Club, American Association of University Women, and League of Women Voters – Marietta Cobb Chapter. This event is open to the public. Admission is $10 and includes all fees and a continental breakfast. For more information and to register, visit Eventbrite.com or akarhozetaomega.org. Visit the "Scholarship Applications" page in the left-side navigation menu or click here for details. The Scholarship Committee at pzoscholarship(@)gmail.com. Need a reason to wear your favorite holiday gear? We’ve got one! 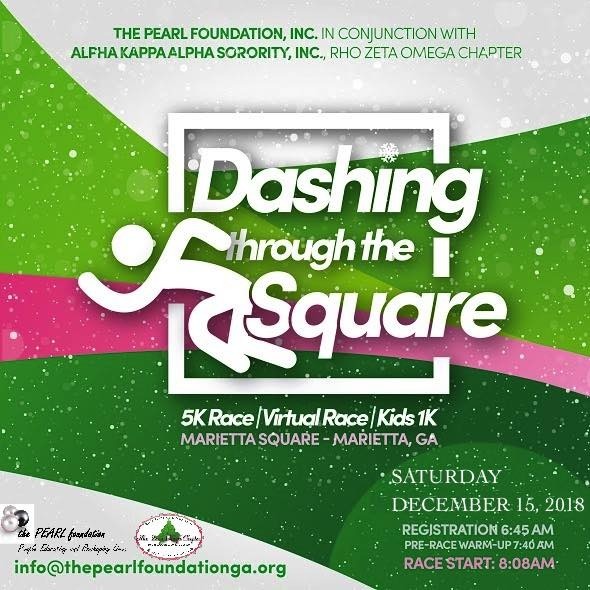 After last year’s festive fun, the annual Dashing through the Square 5K is coming back to town! Join us as we dash through historic Marietta square for a holiday 5K Walk | Run, and 1k Rudolph Run. Dashing through the Square is a Peachtree Qualifying Race featuring electronic chip timing to ensure accuracy for runners. This family friendly race will take you past beautiful, historic homes and the quaint shops that line Marietta Square. Not in Marietta, GA but you want to participate? Join our Virtual 5K! Proceeds from this event will support youth enrichment programs and other community initiatives benefiting Cobb County. 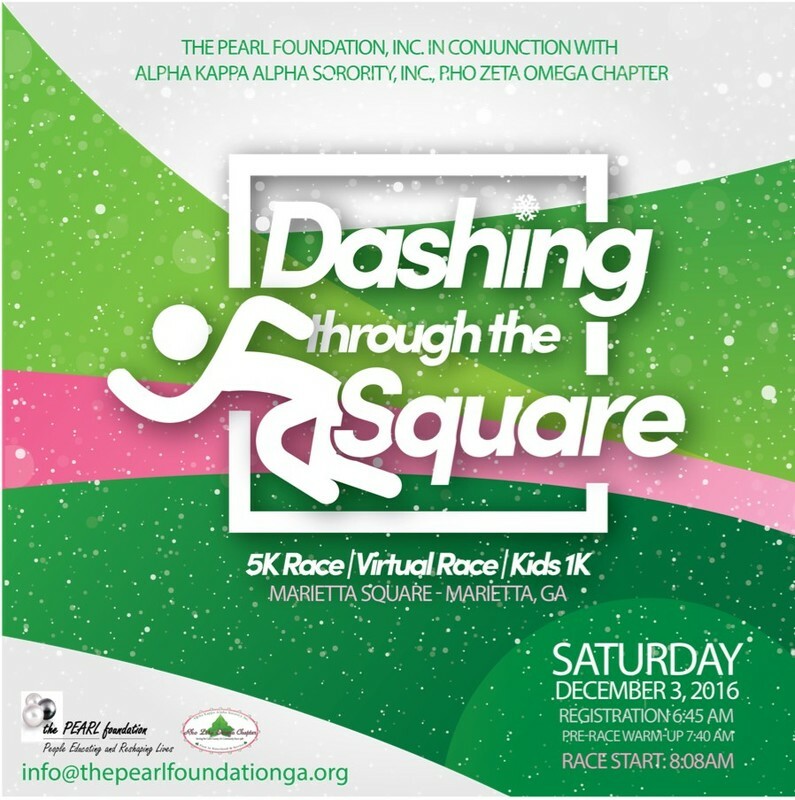 This race is sponsored by The PEARL Foundation, Inc. and Alpha Kappa Alpha Sorority, Inc. – Rho Zeta Omega Chapter. 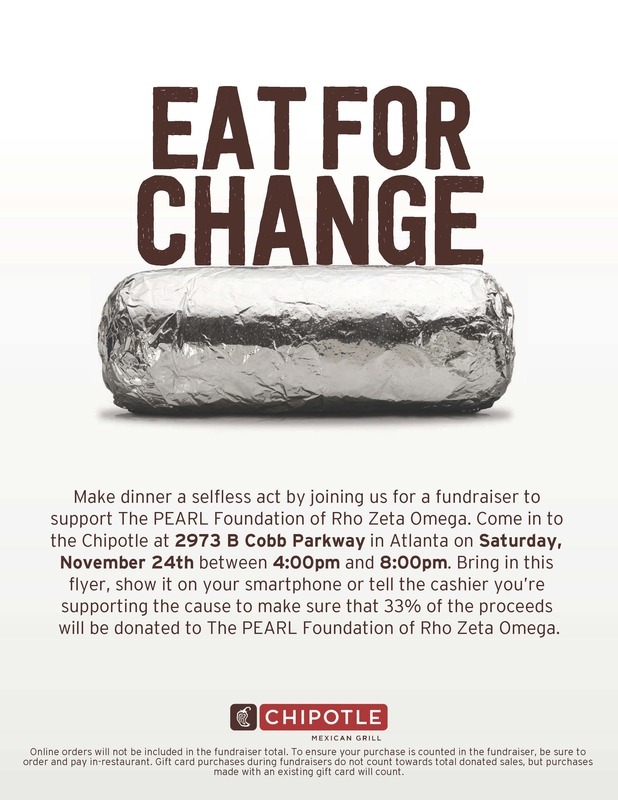 Join us for dinner on Saturday, November 24th at the Chipotle located at 2973 B Cobb Parkway between 4:00pm and 8:00pm! A portion of the proceeds will benefit community programs. Present a copy of the flyer at the register for proceeds to be counted. 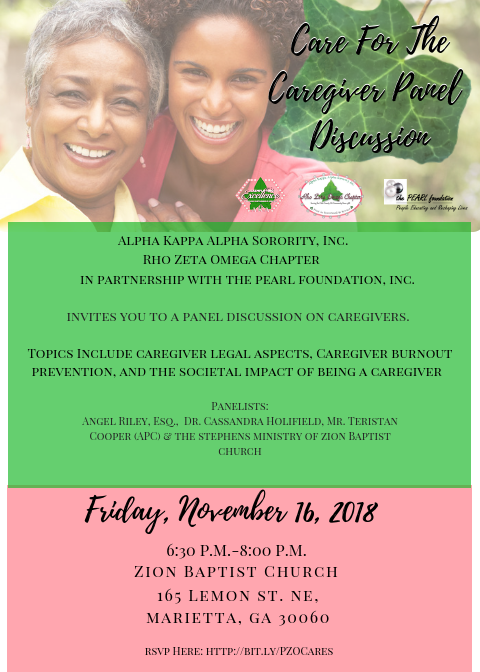 Alpha Kappa Alpha Sorority, Inc. Rho Zeta Omega Chapter in partnership with The PEARL Foundation, Inc. invites you to a panel discussion on caregivers. Topics Include caregiver legal aspects, caregiver burnout prevention, and the societal impact of being a caregiver. Panelists include Angel Riley, Esq., Dr. Cassandra Holifield, Mr. Teristan Cooper (APC) & the Stephens Ministry of Zion Baptist Church. South Cobb High School, in partnership with Alpha Kappa Alpha Sorority, Inc. Rho Zeta Omega Chapter and The PEARL Foundation, Inc. present The HBCU Experience: The Life, The Legacy, The Love. HBCU stands for Historically Black Colleges and Universities. Please come out to hear alumni from HBCUs talk about their journey to and through college. This event is open to all students and their parents. A Midday Rhapsody of Art & Soul returns as one of the Fall premier events! 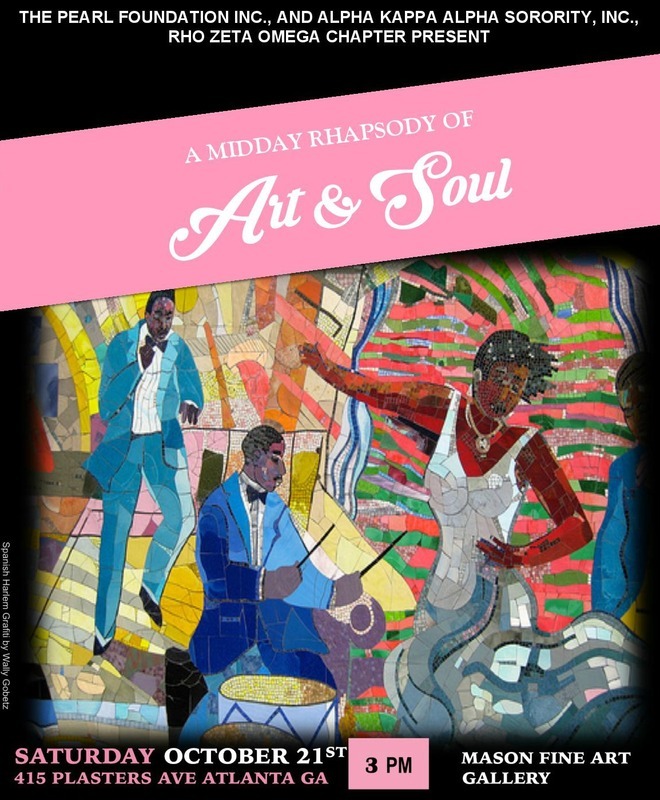 On September 22, 2018, The PEARL Foundation, Inc., and Rho Zeta Omega Chapter of Alpha Kappa Alpha Sorority, Inc., will host its annual, A Midday Rhapsody of Art & Soul fundraising event, to raise funds in support of our scholarship fund and other Cobb County community programs. 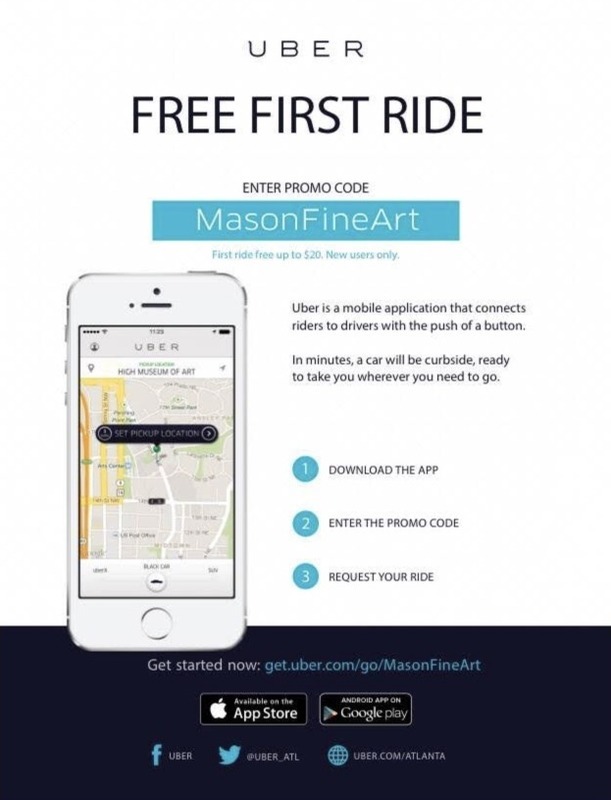 The Mason Fine Art Gallery will provide an exquisite backdrop as we salute the arts community through music, poetry, fashion and art. Local and international artists will be featured as we gather to raise money to support the citizens in need within the Cobb County community. The PEARL Foundation, Inc., along with Rho Zeta Omega Chapter of Alpha Kappa Alpha Sorority, Inc., has awarded more than $290,000 in scholarships to Cobb County high school seniors. The PEARL Foundation, Inc., a 501(c)(3) nonprofit organization, was established to educate and reshape lives in the Cobb County community. 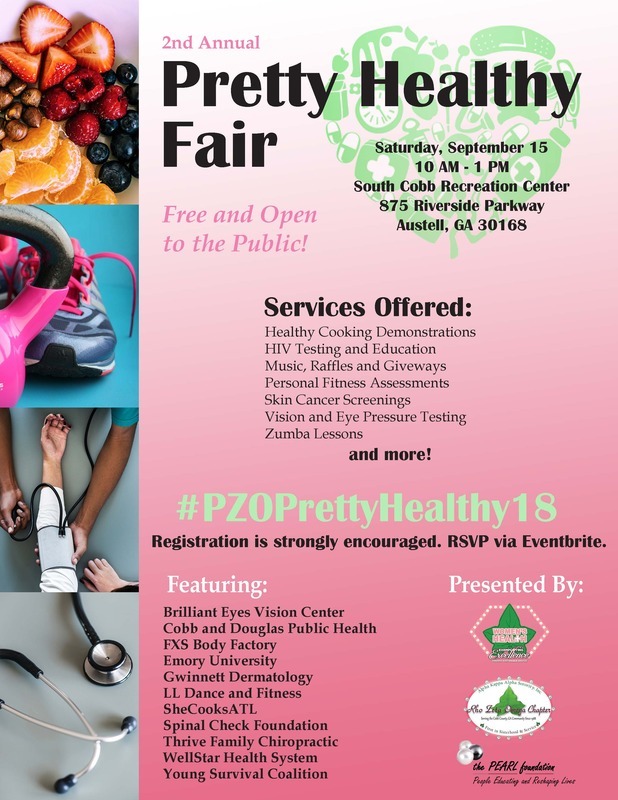 The Pretty Healthy Fair, hosted by the Rho Zeta Omega Chapter of Alpha Kappa Alpha Sorority, Inc. and the PEARL Foundation Inc., returns September 15th from 10 a.m. to 1 p.m. at the South Cobb Recreation Center (875 Riverside Parkway, Austell, GA 30168). This second annual event will offer free services such as health screenings, HIV testing, cooking and fitness demonstrations, and education for the community. In observance of minority mental health month. The Rho Zeta Omega Chapter of Alpha Kappa Alpha Sorority, Inc., The PEARL Foundation and The National Alliance on Mental Illness would like to invite you to a community panel discussion on mental health challenges currently affecting the black community. The panel discussion will occur on July 28, 2018, 11:30AM at Turner Chapel AME, located at 492 North Marietta Parkway, Marietta, GA 30060. Please share the event flyer with your network along with the Evenbrite link below for RSVP. Please contact Joanne Louis, Vice President and Program Chairman, with any questions at pzoprograms [@] gmail.com. 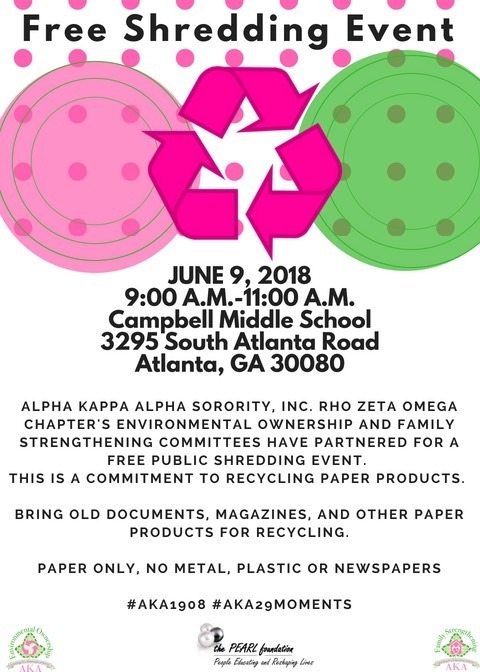 You are invited to recycle your paper products with us on Saturday, June 9, 2018 from 9:00 A.M. until 11:00 A.M. at Campbell Middle School, 3925 South Atlanta Road, Smyrna, Georgia 30080. 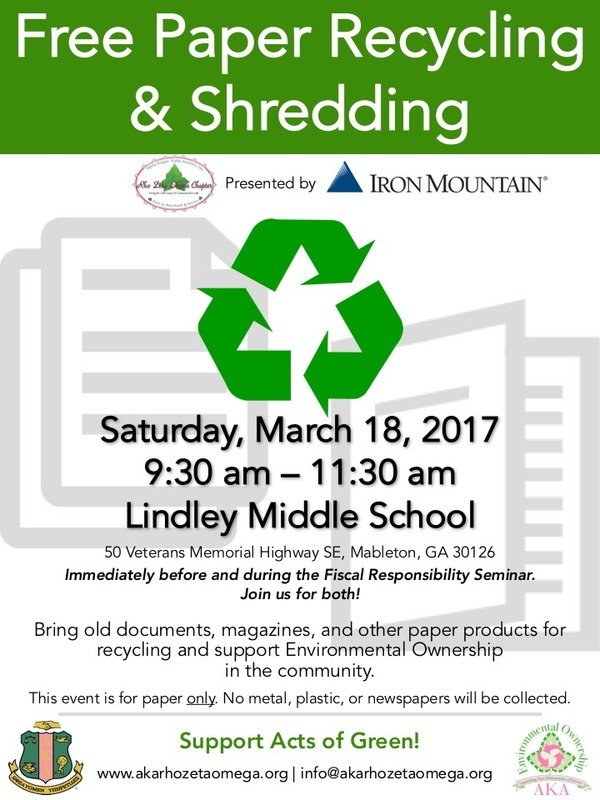 Please bring PAPER ONLY - no metal, plastic or newspaper. The conversation about the opioid epidemic does not share how it affects the different minority groups that may have limited information and awareness about the problem. 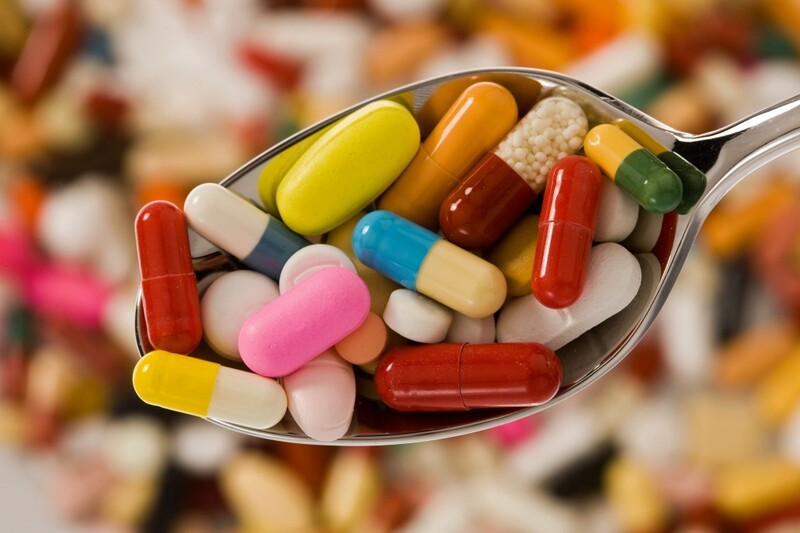 Women appear to be suffering from prescription drug abuse and overdose at a higher rate than has been suggested by current research and statistics. Being aware of how this epidemic also impacts women is important in being able to identify warning signs prior to tragedies occurring. If minority groups are not included in the conversation, it can be easy to overlook the symptoms and limit the opportunity to provide the appropriate support. With the continued occurrence of mass shootings, the role that mental illness plays in these tragedies is a question. Therefore, it is important to know what truly qualifies as a psychiatric disorder. Antisocial personality disorder (ASPD) is characterized by a pattern of socially irresponsible, exploitative, and guiltless behavior. Individuals who have ASPD tend to disregard and violate the rights of others around them. ASPD is typically associated with other mental illnesses, including addictive disorders and medical complications. ASPD begins early in life, usually by age 8 years. Diagnosed as conduct disorder in childhood, the diagnosis converts to ASPD at age 18, if antisocial behaviors have persisted. While chronic and lifelong for most people with ASPD, the disorder tends to improve with advancing age. Earlier onset is associated with a poorer prognosis. Many people use the term "antisocial" incorrectly, so it is important to share the true meaning to make everyone aware and informed. Please click the following link for more information. Phrases that reference psychiatric diagnoses (i.e. I'm so OCD, or the weather is Bipolar, or he is schizo) are often thrown around in flippant and inappropriate ways. These statements further encourage the stigma related to mental illness and often undermine the experiences of people who actually suffer from these disorders. When mental illness is trivialized, it makes having a mental illness that much harder for those living with the disorder. It can also reduce the chances that people who actually suffer from mental illness will seek out the help that they need. While it is important to raise awareness of mental illness, it is equally important to accurately depict behaviors and symptoms associated with these diagnoses. 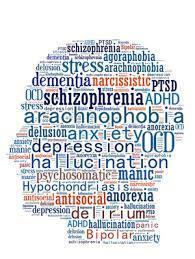 Please click the following link to learn more about 10 commonly misused mental health diagnoses, what they are, and what they are not. Experiencing sadness as a result of losing a loved one, getting fired from a job, or going through a significant life changing event is normal. However, when that sadness becomes persistent and pervasive over a period of time far past the presence of stressors, this could be an indicator of a depressive disorder. 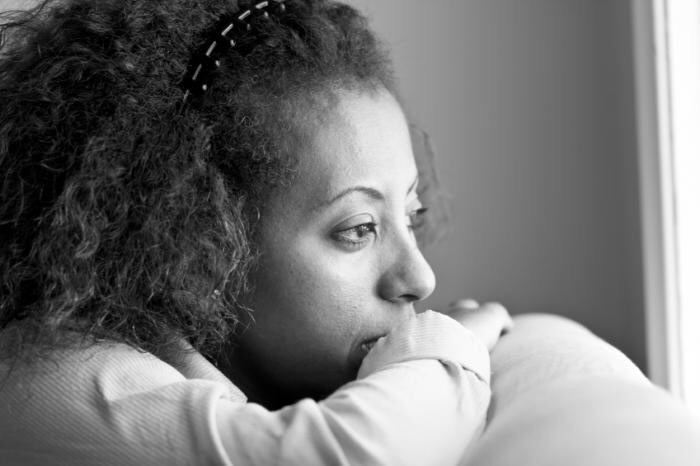 Depression tends to occur in women more often than men. Additionally, depression typically looks different for women and men. Depression can also occur in children. 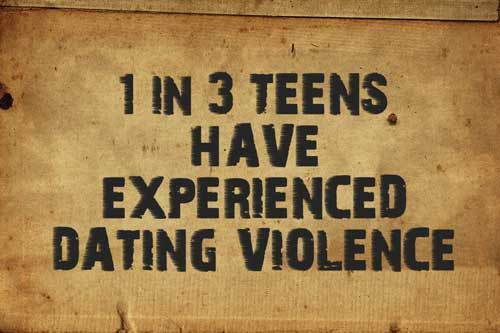 Approximately, 1.5 million adolescents experience physical abuse in a dating relationship in one year. One in three adolescents experience some form of abuse in a dating relationship. Girls and young women between the ages of 16 and 24 experience the highest rates of intimate partner violence, almost triple the national average. Thank you to all that have purchased tickets! 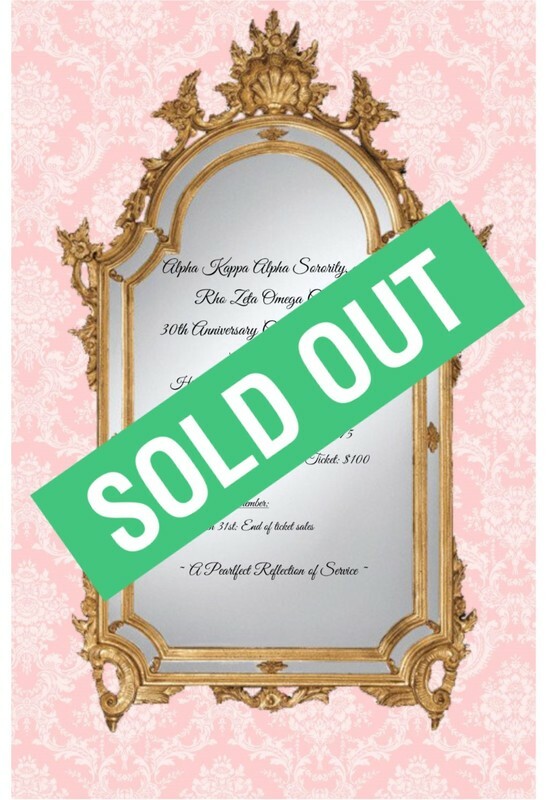 The Rho Zeta Omega 30th Chapter Anniversary weekend has SOLD OUT! It’s time to celebrate OUR 30 years of service! We’re going to look back at Rho Zeta Omega's "Pearlfect Reflection of Service" in our community and look forward to the bright future ahead providing "service to all mankind" in sisterly love! We look forward to seeing you, your family, and all of our friends there!!! Let the grand times roll! Thank you to our 30th Anniversary Committee for all of your hard work! The Rho Zeta Omega Chapter and the PEARL Foundation are proud to present a Fiscal Responsibility Seminar entitled "Securing The Bag to Build Financial Wealth". 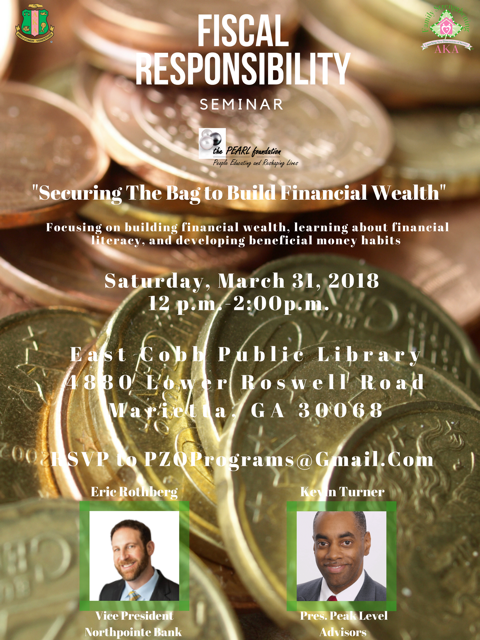 The seminar will occur Saturday, March 31, 2018 from noon until 2:00 PM at the East Cobb Public Library, 4880 Lower Roswell Road, Marietta, Georgia 30068. The Seminar will focus on building financial wealth, learning about financial literacy, and developing beneficial money habits. Gather your girls, grab your guy and get your tickets for a "Pearlfect Reflection of Service" weekend affair! Come celebrate the 30th Anniversary of the Rho Zeta Omega Chapter of Alpha Kappa Alpha Sorority, Inc. on April 13th and April 15th, 2018 at the Hilton Atlanta Marietta Hotel and Conference Center. For all other inquiries, please contact eventspzo@gmail.com. Tickets are selling fast and you don't want to miss this "Pearlfect" weekend to remember! 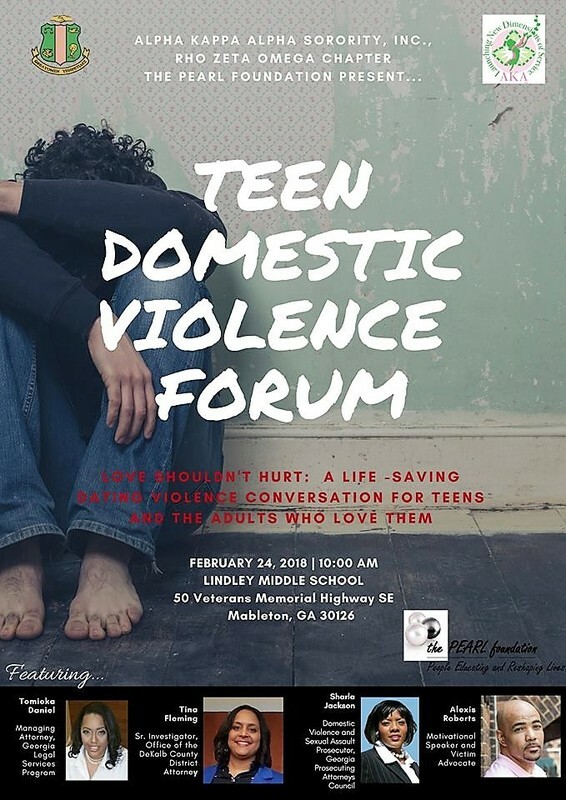 Join us Saturday, February 24 at Lindley Middle School for an open discussion on the harrowing reality of teen domestic violence. Our special invited guests include Tomieka Daniel, Managing Attorney for Georgia Legal Services; Tina Fleming, Supervising Investigator, Sexual Exploitation & Crimes Against Children (S.E.C.A.C.) Unit, Office of the DeKalb District Attorney; Sharla Jackson, Domestic Violence and Sexual Assault Prosecutor; and Alexis Roberts, Motivational Speaker and Victim Advocate. Can't make it to Marietta, GA? Don't worry, we've got you covered! Virtual attendees have 2 registration options to choose from. This year's event includes a 5K, a Virtual 5K and the 1K Rudolph Run. The race is a Peachtree Qualifying Race and features electronic chip timing to ensure accuracy for all runners. 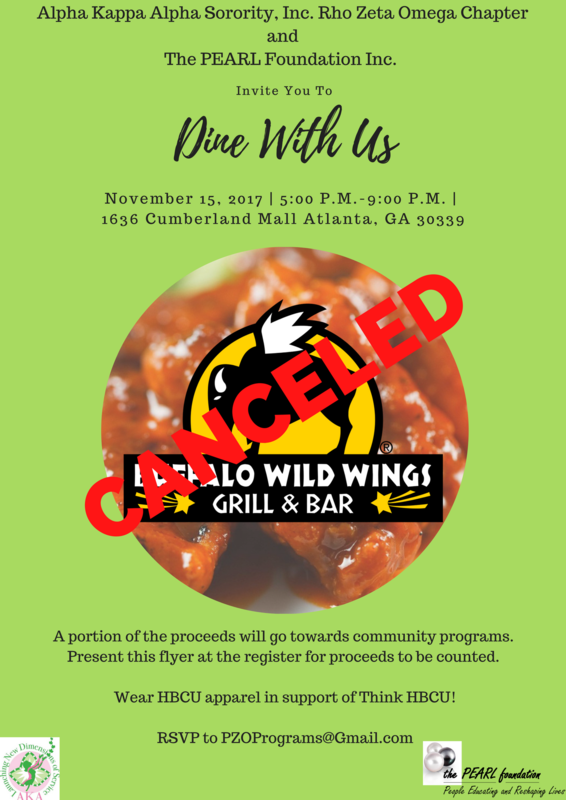 Our Wednesday, November 15 Dine-Out has been canceled. Thank you to all of our members and supporters who planned to attend. strong leadership to ensure equality for all both at home in the U.S. and abroad. found at the heart of the United Nations’ mission. 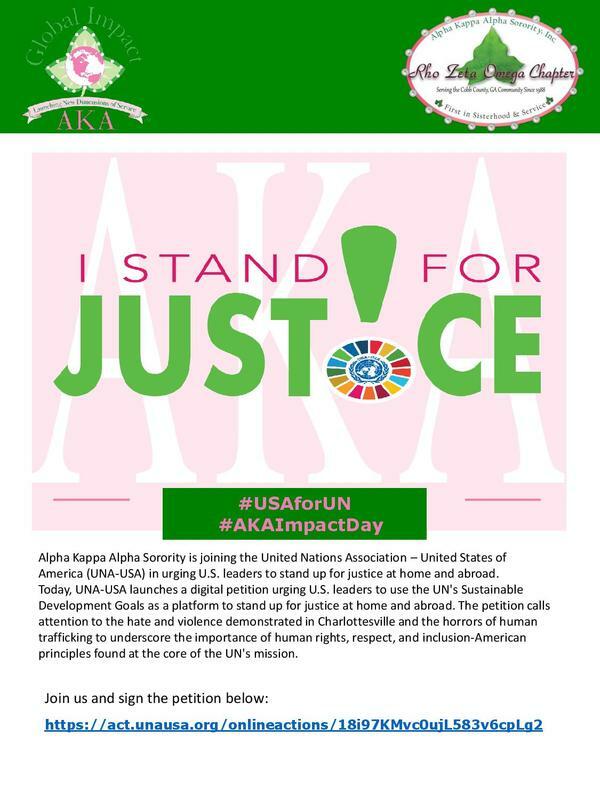 Alpha Kappa Alpha Sorority, Incorporated is joining the United Nations Association – United States of America (UNA-USA) in urging U.S. leaders to stand up for justice at home and abroad. Today, UNA-USA launches a digital petition urging U.S. leaders to use the UN's Sustainable Development Goals as a platform to stand up for justice at home and abroad. The petition calls attention to the hate and violence demonstrated in Charlottesville and the horrors of human trafficking to underscore the importance of human rights, respect, and inclusion-American principles found at the core of the UN's mission. Visit http://www.unausa.org/advocacy/advocacy-agenda/stand-for-justice to sign the petition and add your voice! 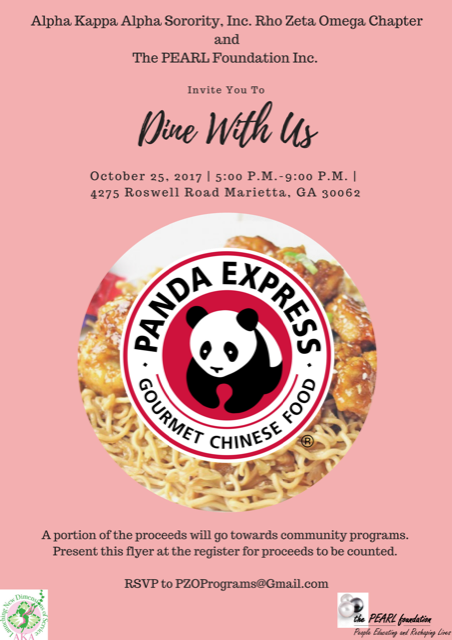 Join us for dinner on Wednesday, October 25th at the Panda Express located at 4275 Roswell Road, Marietta, GA 30062! School lunch programs provide breakfast and lunch for many students. These programs are important because some students may receive all their meals from school alone. On average schools are provided $5 or less per child per day to provide this service. 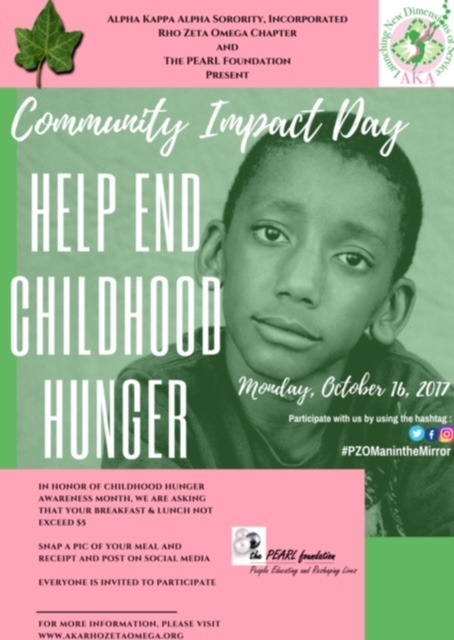 Therefore, in observance of Childhood Hunger Impact Day 2017 (Monday 16 October), Rho Zeta Omega chapter of Alpha Kappa Alpha Sorority, Inc is challenging members and the community to spend a combined total of $5 or less for breakfast and lunch. You can participate in the "Man in the Mirror" challenge by posting a picture of your meals and the following message on Social Media on Monday 16 October. For every person that participates in the “Man in the Mirror” challenge, Rho Zeta Omega Chapter of Alpha Kappa Alpha Sorority, Inc will donate $5 to Atlanta Food Bank (up to $800). Catch a ride to our DAY PARTY with this special offer! 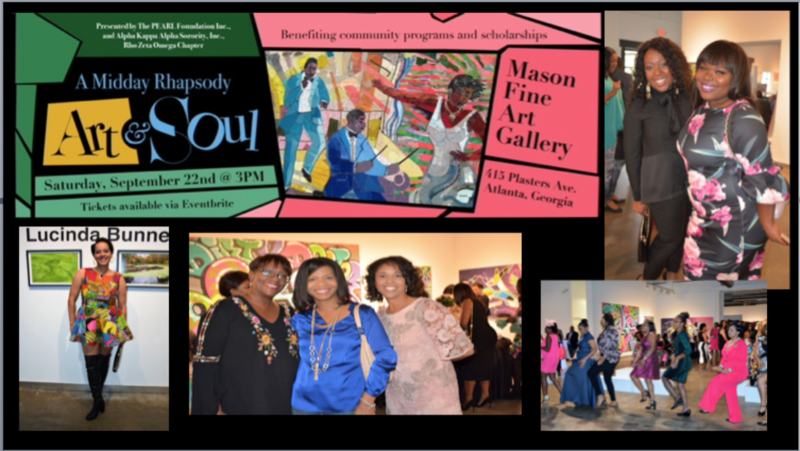 On Saturday, October 21, 2017, Alpha Kappa Alpha Sorority, Inc., Rho Zeta Omega Chapter, in conjunction with The PEARL Foundation Inc., will host "A Midday Rhapsody of Art & Soul" fundraiser at Atlanta’s Mason Fine Art Gallery. Come enjoy live music, cocktails, spoken word, fashion, food, and fine art. 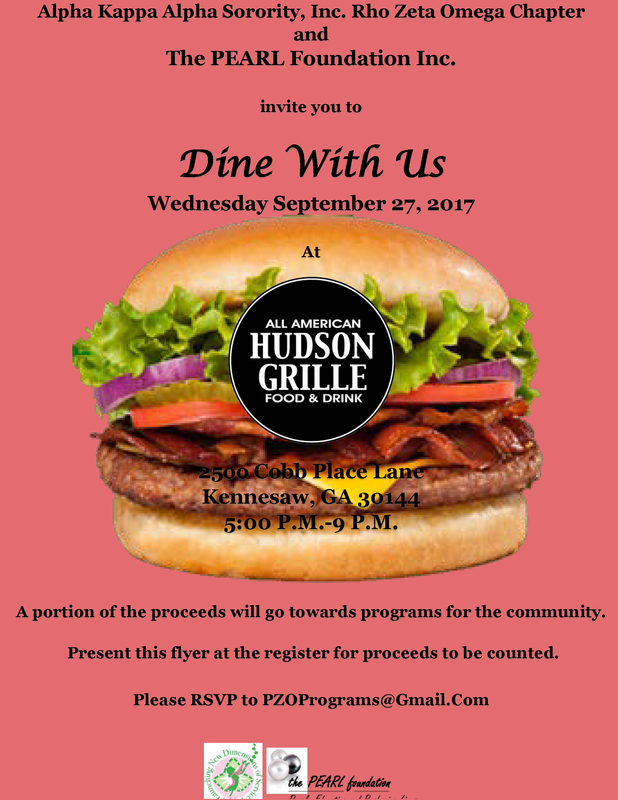 Join us for dinner on Wednesday, September 27th at the Hudson Grille located at 2500 Cobb Place Lane in Kennesaw, Georgia 30144! When people are suicidal, they often suffer in silence, not opening up for fear of being judged, misunderstood, or unheard. Loved ones often notice that something is wrong, but don't say anything because they aren't sure what to say or they fear saying something wrong. The silence surrounding suicide can be damaging and is, at worst, deadly. It is time to start talking about suicide and raising awareness so that we can save lives. 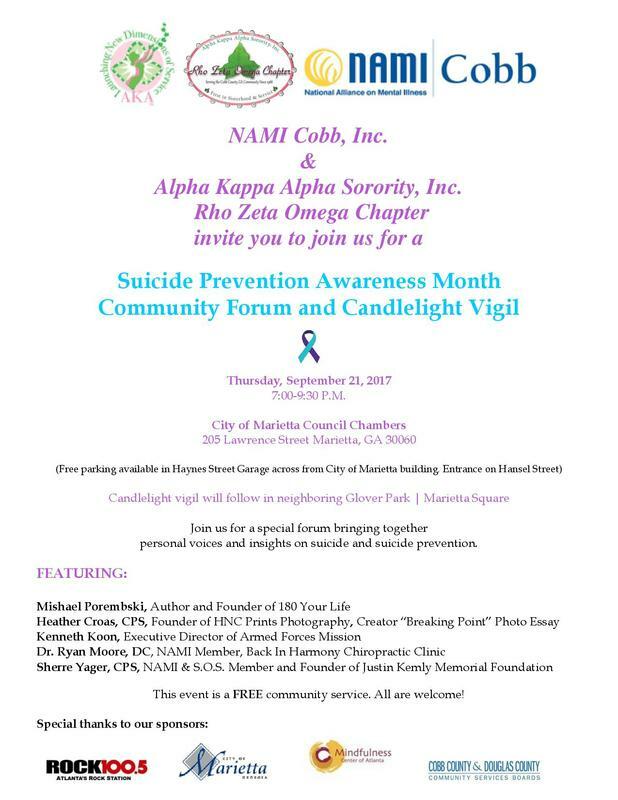 Please join the Alpha Kappa Alpha Sorority, Incorporated, Rho Zeta Omega Chapter and NAMI Cobb for a Candlelight Vigil on Thursday, September 21, 2017 at 7:00pm. We will meet to provide hope for those that struggle with suicidal thoughts and honor those we have lost to suicide. Please join us at The City of Marietta Council Chambers at 250 Lawrence Street, Marietta, Georgia 30060 for a panel discussion. The discussion will be followed by a vigil at nearby Glover Park to honor those we have lost and provide hope for those who suffer. Please share with anyone that could benefit from this event. 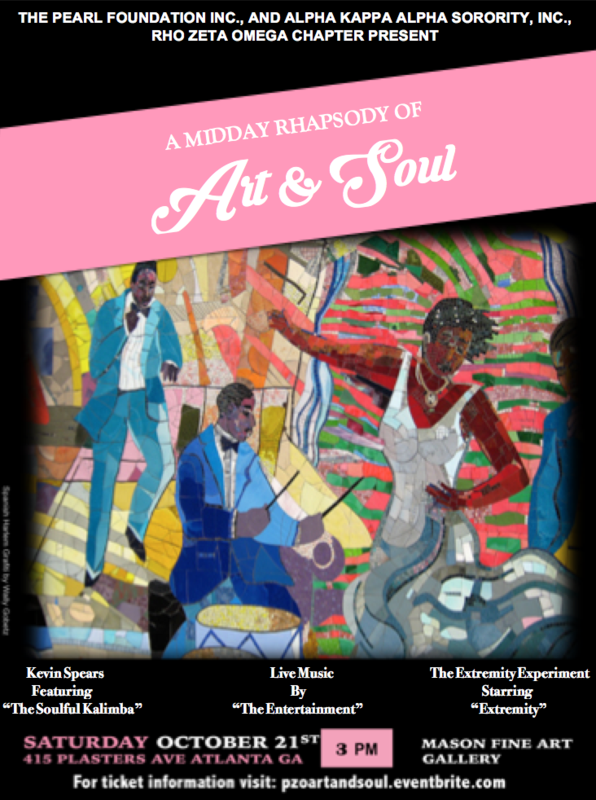 "A Midday Rhapsody of Art & Soul"
or for more information on this event. The Rho Zeta Omega Chapter of Alpha Kappa Alpha Sorority, Inc., in association with National Alliance on Mental Illness, invites the community to a free panel discussion on common mental health issues facing the African American community. Doors Open At 11:00 a.m. Program begins at 11:30 a.m.
Join us for a Skate Party! 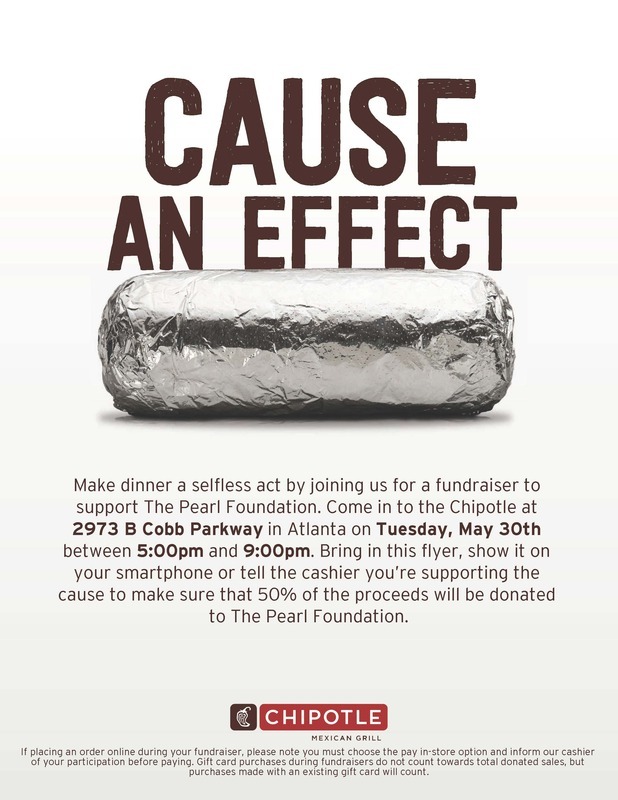 7:00 p.m. until 11:00 p.m.
Join us on Tuesday, May 30th at the Chipotle located at 2973 Cobb Parkway (near Cumberland Mall) for dinner! Today's article focuses on boosting your mental health. Regardless of whether you are suffering from a mental illness, everyone can benefit from improving their overall mental health and well being. Today's article provides some tips for boosting your mental health! 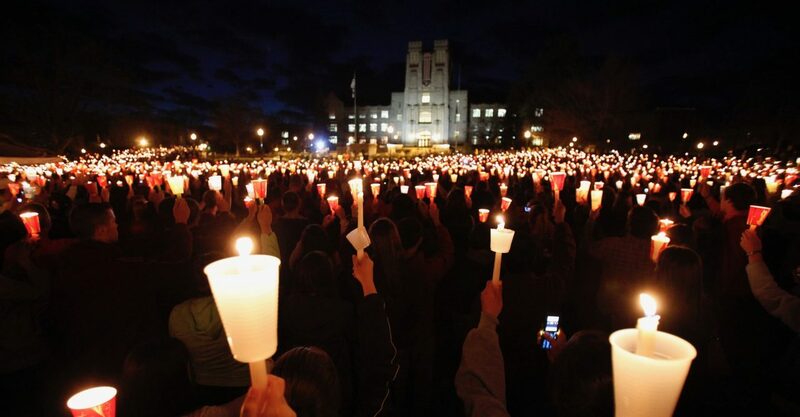 Today's article focuses on college students and some of the mental health challenges they experience while on campus. College can be a difficult transition for most students. The severity of this transition increases significantly when a student is facing a mental health issue. Additionally, this article includes tips for parents who have students in college and how they can support their college students. Today's article focuses on the different behaviors that educators and other individuals working in the school system can identify in students who may be exhibiting a mental illness. Oftentimes, educators are the first to notice behaviors in children that may be indicative of a mental illness. It is imperative for them to address these behaviors and offer support to the students and their families. Today's article focuses on raising awareness of mental health in children. Research suggests that half of all lifetime cases of mental illness begin by age 14. It is very important for parents to be able to recognize when their child is experiencing challenges, especially those related to mental illness. Earlier recognition leads to earlier intervention and improved outcomes. Do you know how to recognize if your child is displaying behaviors related to mental illness? Mental illness affects 1 in 5 adults in the US. Yet, we continue to avoid the conversation, which ultimately leads to people not getting the help they need. Find out how you can contribute to stopping mental illness stigma and begin to promote mental health in your family and community. Join us Saturday, May 20 at 10:00 AM in Piedmont Park for a moderate full body workout. Register today at this link. The Rho Zeta Omega Chapter of Alpha Kappa Alpha Sorority, Inc., is accepting applications to its ASCEND program for high school students living and attending schools in Cobb County. The Rho Zeta Omega Chapter of Alpha Kappa Alpha Sorority, Inc., is accepting applications to its ASCEND℠ program for high school students living and attending schools in Cobb County. The ASCEND program is the signature youth enrichment program of Alpha Kappa Alpha Sorority, Incorporated. The program is designed to motivate, engage and assist high school students in reaching their maximum potential. Its focus is on Achievement, Self-Awareness, Communication, Engagement, Networking, and Developmental Skills (A.S.C.E.N.D.). The participants in ASCEND will have an opportunity to receive academic enrichment and life skills training to support their journey to college or vocational employment. ~ Submit most recent report card. All interested applicants should submit the application with other requirements, no later than June 1, 2017 to the address below. Applicants will be contacted following the review process. 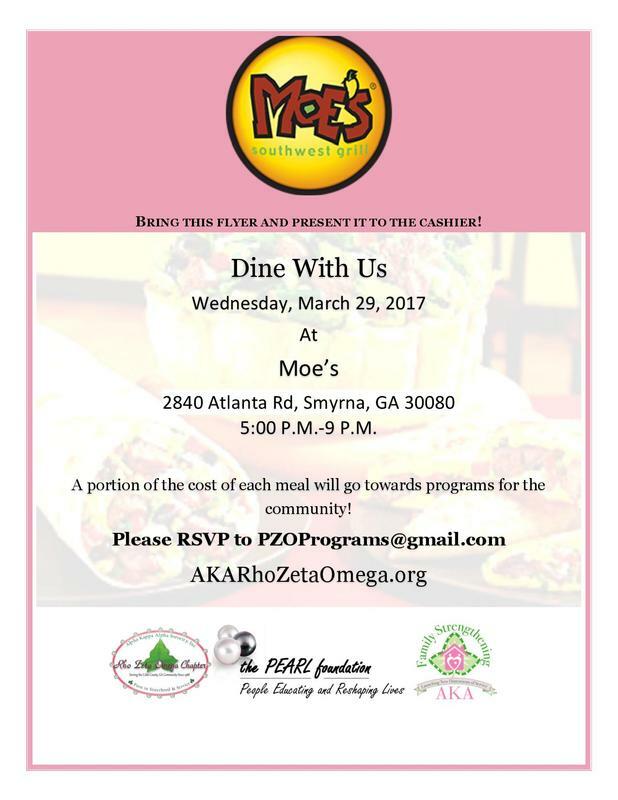 Join us on Wednesday, March 29th at the Moe's located at 2840 Atlanta Road in Smyrna for dinner! What Is It, and Why Do It? How many times have you heard how important it is to have an emergency fund? I think we can all agree that saving for an emergency in any economy is important, but in the current economic environment it should be of utmost importance for every American. According to a Forbes study in 2016, 63% of Americans don’t even have enough in savings for a $500 emergency. An annual survey by Bankrate.com revealed that 29% of Americans don’t have any money set aside at all. An emergency fund is cash you save up for the purpose of helping you to prepare for unexpected life events so they don’t become crises. Unexpected car repairs, an urgent medical treatment, a job layoff, and bereavement-related expenses for an unexpected death in the family are all events that qualify as emergencies. Unfortunately, the majority of us have experienced at least one, if not all, of these events in our lives. One of the main reasons to establish an emergency fund is to avoid going into debt for a cost you can’t afford. Emergency fund ensures you don’t have to get a loan from a friend or max out credit cards when “life” happens. One thing we can all agree on is that unforeseen circumstances affect us all. Pre-planning for the inevitable is the key to maintaining balance in the financial aspect of your life. Whether you follow the advice of Suze Orman and establish an emergency fund of eight months of living expenses, Dave Ramsey’s guide which dictates that $1,000 is sufficient for a start, or if you take heed to Michelle Singletary, who advises us to stash away three to six months of living expenses - just establishing an emergency fund is half the battle. Your decision should be based on your individual situation. Homeowners, parents (people with children), and people uncertain about their job security are examples of those who should be on the more aggressive side of saving. Many advisors suggest that whatever amount you can afford to set aside is fine initially, as long as you start! Once you have determined what you can afford to easily put away without it causing stress in your life, have that amount automatically drafted from your paycheck and deposited into a savings account that you vow not to touch. If you have very little willpower and are easily tempted to spend, take it a step further and ensure there is no ATM card linked that gives you easy access to the savings account. This way, you will decrease temptation. You can also build up the account quicker by depositing any windfall money, such as bonuses, raises, or refunds. Just remember, this isn’t meant to feel like a punishment. For many who aren’t accustomed to having financial discipline, this won’t be fun at first. Telling yourself no, especially when you feel like you have earned the right to spend, can be very difficult. Change your mindset. This temporary restriction results in long-term benefits, like less financial stress. The emergency fund is here to protect you. Protection gives peace of mind, and that’s what we should all strive for. Over the years, debt has become a major issue that needs to be addressed. From credit cards to student loans, debt has become the norm in society. Most Americans have some type of debt that includes credit cards, student loans, auto and recreational vehicle loans, personal loans and/or a mortgage or home loan. It is rare to find someone who does not have any type of debt. According to USDebtClock.org, the United States seems to loves debt. This month alone, the US Debt Clock reflected the U.S. was $19.9 trillion dollars in debt which is rising by the second. Getting into debt is very easy to achieve, however getting out of debt can be extremely difficult. Before discussing how to pay off high interest debt, let’s look at some 2016 statistics from Value Penguin. Average American Household Debt: $5,700. Household that carry some sort of credit card debt: 38.1% of all households. Households with the lowest net worth (zero or negative) hold an average of $10,308 in credit card debt. The Northeast and West Coast hold the highest average credit card debt – both averaging over $8,000. Credit card debt appears to peak for individuals who are between 45 and 54 years old - $9,096. If getting out of debt was easy, everyone would be out of debt. To get out of the debt cycle, you will need to have a change of mind and behavior. Once you have made a conscience decision that you want to get out of debt, you are half way there. Let’s look at a few things to consider when reducing or eliminating debt. First you must have a written goal of the amount you desire to payoff and a specific date. There are several methods that can be used to pay off high interest debts, but you must choose the one that works best for you. Some experts suggest you pay off the smaller debts first. REMEMBER: If you are paying any interest on loans or credit cards, you are paying too much! The most effective way to begin is by reviewing your budget to determine your debt balances and the APR (or interest) you are currently paying. APR is the Annual Percentage Rate and is known as another term used for “interest paid over time”. I recommend creating an excel spreadsheet to include all of your credit cards, student loans, auto and personal loans and even your mortgage (if applicable). The spreadsheet should include the creditors name, due date, APR (or interest rate), current balances and minimum payment due. This information can be found online or by reviewing your recent statement. If this information is unavailable, you can call the creditor to confirm this information over the phone. When paying off credit card debt, make more than the minimum payment. Any additional payment amount above the minimum payment will be applied towards your outstanding balance. Every little bit helps. Let’s look at three methods you can use to pay off debt. They are paying off debt over time, transferring balances and possibly a cash out refinance. Once you evaluate your bills and determine the highest interest rate or APR, begin paying off the smallest balance with the highest interest rate first. Once the bill is paid off, take the minimum payment that you use to make on the paid off bill, and apply it towards the next appointed bill to be paid in full. Once the second bill is paid in full, take the third appointed bill and apply the minimum payments from the first and second bills (which are now paid off) and apply those previous payments towards the third bill until it is paid in full. Continue this method until all of your bills are paid off. Once you experience the thrill of the first bill being paid off, you will become excited and motivated to payoff more bills. Remember when paying off credit cards, always make more than the minimum payment and make the payment on or before the due date. Any additional payment amount above the minimum payment, will be applied towards your outstanding balance. If you are late, the late fee may overtake or cancel the minimum payment causing your balance to possibly increase. Late payments may also cause your APR or interest rate to increase. Many banks and financial institutions offer Zero percent interest rate on their credit cards for 6-18 months as a promotional offer. This is an excellent method if you qualify for this promotional offer. The offer allows you to transfer your current high interest balances from one (or multiple) credit cards with balances to the Zero percent interest rate card. With these offers, be careful to read the fine print regarding additional purchases on the same card that was used for the balance transfer. Often times, the purchases on the balance transfer card will be calculated on a different rate than the Zero percent. This is call mixed rates. For example, purchases made on the same card may have a 18% Purchase APR, while the Zero percent promotional rate in effect is for the balance transfer amount. Once the promotional offer at Zero percent is over, the interest rate will increase. You may then see the purchase rate at an 18% APR and the promotional rate increase to 24%. Additionally, avoid making late payments as this may jeopardize (or cause you to lose) your Zero percent interest during the promotional period. It is not uncommon for credit card companies to increase or raise your interest rate due to late payments. Again, please read the fine print. If you have owned a home for a while, you may have equity in the home. If so, you may be eligible for a Cash Out Refinance with your lender. If you have enough equity, and if the numbers make sense, this could be an option to look into. If feasible, this will allow you to leverage the equity in your home to save the monthly interest and payments on the credit cards or loans. It may also provide you a tax write off as some of the interest may be tax deductible. HOWEVER, please refer to your tax professional. If you choose to refinance your debt in the mortgage, beware not to charge the credit card balance back up again. If you choose this method, it is strongly suggested that you have a game plan or strategy of how to stay out of debt. For example, you may want to cut up all credit cards except one and only use it for emergency purposes. As you can see, this method does require self-discipline. In review, there are many options to consider when paying off high interest debt. Before making the decision, think of strategies that will best fit your situation, check with a tax professional, understand the program before agreeing to any changes and always make your payments on time. Set the goals, write them down and become debt free from high interest debt. You can do it. Best of luck! Guess what? 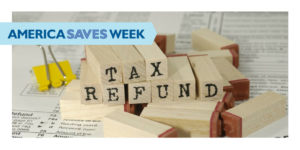 It’s tax time and if you’re like me, you’re trying to figure out how to spend the refund. For the majority of us, we will be receiving a sum of money greater than our normal paycheck. I keep asking myself, what am I going to do with the money? I remember when I viewed my tax refunds as unplanned bonuses. My first thought is to spend it, treat myself to a gourmet dinner or purchase a new television but my thoughts come back to reality and I realize I have expenses that are a priority. Another option is to save some of the money to help me get closer to a financial goal, such as going on a dream vacation or to help me gain peace of mind for a rainy day. Pay down your debt. Use your refund for some much needed debt relief. Pay off your credit card balance. If you have an outstanding balance on more than one credit card, try to pay off the smaller, high-interest rate balances first. That will free up more funds to put towards larger balances. Alternatively, you can apply your refund toward other debts like a car loan or a home equity loan. Save for a rainy day. Why not give yourself an even bigger return on your tax refund by putting the money into a savings account, CD, or retirement fund? Your tax refund will continue to grow if you put it into savings or invest the money. It's always helpful to have a savings account to draw from when a major car repair bill, medical emergency or other unexpected expense comes along. That way you don't have to borrow money and add to your debt-load. Consider your financial goals. 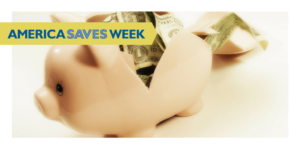 Trying to save for a house or car down payment? Hope to contribute to your child's college tuition? Consider applying your tax refund toward these goals. If you don't yet have a set of short-term and long-term financial goals, create one. You'll be more conscientious about how you spend your refund or any other extra money that comes your way. Savings Bonds. This is a great way to kick start or grow your savings for the future. 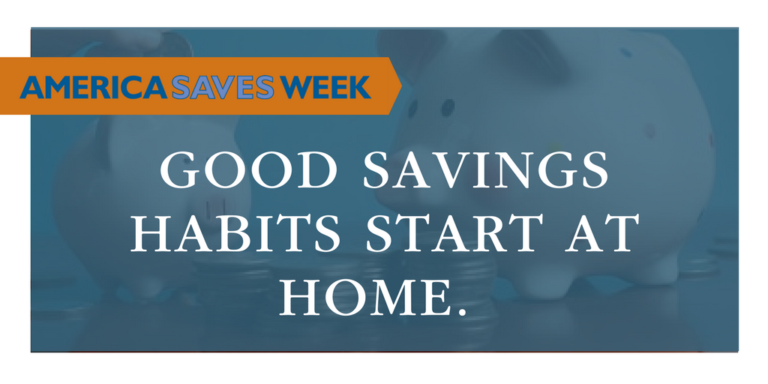 U.S. Savings Bonds are a safe and easy way to do it. Bonds are safe, bonds will never lose value and they are backed by the U.S. Government. Your money will start growing immediately and you help your loved ones live their dreams when you buy bonds. Remember, we work hard for our money and we deserve to enjoy a healthy financial lifestyle. Put some thought into how you use your tax refund. Making smart financial decisions is not always easy, but it will definitely benefit you and your family over the long term. 50% of American households have no retirement savings; 401k; IRA; etc. 29% of people 55 or older do not have a retirement savings or Pension. For many retirement is here, for others retirement seems far off in the distance. 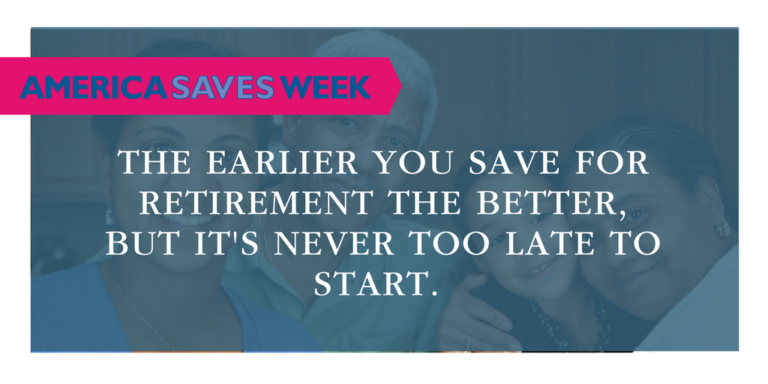 No matter how far away you are from retirement the best time to start planning is now. The earlier you start the process the better off you will be at retirement age. Investing for retirement, so you can retire with dignity will require planning. To start the planning process, you should consider the end from the beginning. - At retirement, do I want to maintain the same standard of living? - What is my financial independence number? - What are/will be my monthly expenditures? - How much money will I need at retirement to retire with dignity? Retiring with dignity is when you retire and you are financially independent. The amount of money needed to retire with dignity will vary for everyone. As an example, in order to receive $50,000 a year in retirement income you would need over $1M dollars in retirement savings. Many people would like to have over a million dollars in their retirement savings. Quite a bit of planning and discipline is required to acquire a sizeable retirement savings. Also, one must understand the Rule of 72. The Rule of 72 determines how long it would take your investment to double based off of the interest rate your investments are returning. 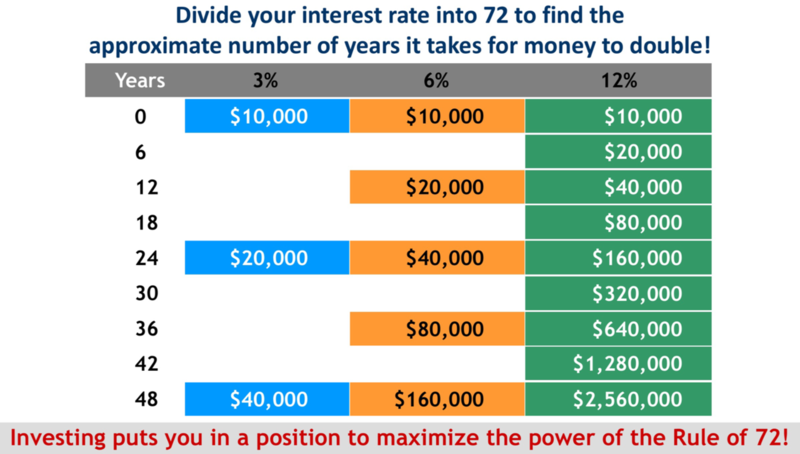 Divide the interest rate by 72 to determine how long it would take to double your investment. For example, if you had an investment returning 1% on a yearly basis it would take 72 years for your money to double. Do you have 72 years for your money to double? The chart below shows how an investment of $10,000 dollars would double at 3%, 6% and 12% over 48 years. How to get to a place where you can possibly have over $1M dollars in retirement savings. 1. Start investing as soon as possible into a 401k, IRA, etc. - The more time you have to invest, the closer you will be to realizing your retirement goals. 2. Remain consistent when investing. - Consistency is the key to your investment breakthrough. 3. Avoid the temptation to pull money out of your retirement fund. - Do not be tempted to use your retirement money for things other than retirement. - Create an emergency fund and short term savings to handle other expenses. The chart below shows Investors A-D, investing $5,500 at a 9% return on their money in a retirement fund. Note: the investment amounts and interest rates are the same. There is a drastic difference when the investor has more years and time to invest. Time and interest earned on your investments are critical to investing for retirement. Which investor would you prefer to be when you reach retirement age? Contact us to discuss strategies for investing for retirement and retiring with dignity. Terry R. Graham is a registered representative of and offer securities through CCF Investments, Inc. a Registered Broker Dealer, a member of FINRA and SIPC and a wholly owned subsidiary of Capital Choice Financial Services, Inc., a network of independent business men and women representing various Life and Health Insurance companies. 1041 Founders Row, Greensboro, GA 30642 (706) 453-1995. Legacy Builders Wealth Management is not a subsidiary or affiliate of CCF Investments, Inc. or Capital Choice Financial Services, Inc.
As adults, we understand how critical it is to save funds for the rainy days but when did we learn how to stash our cash? Research has shown that a large percentage of adults learn how to effectively save post-high school. The truth is that there are many of us that do not set aside enough funds for emergency and extracurricular events. According to Money Under 30, financial advisors recommend adults to set aside 20 percent of their monthly income. More than income or investment returns, your personal saving rate is the biggest factor in building financial security. Parents have an opportunity to instill money-saving skills in their children since kids learn many of their behaviors from their parents at an early age. When all members of the family are saving, the household is stronger. During the first stage, parents should help their children to stay focused on responsibilities by completing tasks timely. Consider incorporating the Pretend Play game where you may crate the scenario to act-out grocery shopping to engage the child with decision-making combined with spending. Stage two teaches us that middle school children are prepared to earn an allowance and save money. Take a moment to highlight a few items from your receipts and share your thought process with your child with regards to how you are able to estimate the cost of goods and be sure to round up to cover the sales tax. Stage three explains that young adults experience real-life rewards and consequences as a result of their decision-making. Select the careers of two family members and the level of education that one must obtain to qualify for the respective career in order to demonstrate how critical decision-making is over a lifetime while striving to meet long term financial goals. Parents should support the saving habits of their children to encourage problem-solving skills. So, how is financial success measured? Experts say that you are successful when you are able to 1) control the day-to-day finances and 2) when one has the capability to absorb a financial shock. Money saving opportunities exist all around us. It pays off to shop around no matter what services you are seeking. The Kuntry Klub is running a Family Photo & Prom special through May 15. Contact Chris Jones at (404) 519-1885 to book. View our portfolio at www.thekuntryklub.com. It is not necessary to be an expert with financial matters to reap the rewards of family savings. Set a household goal and gradually work to meet your financial target. It’s All About the Automation! Have you heard of the saying “out of sight, out of mind?” The overall premise of the saying is related to what you are unable to see and touch, something that is not at the forefront of your mind. 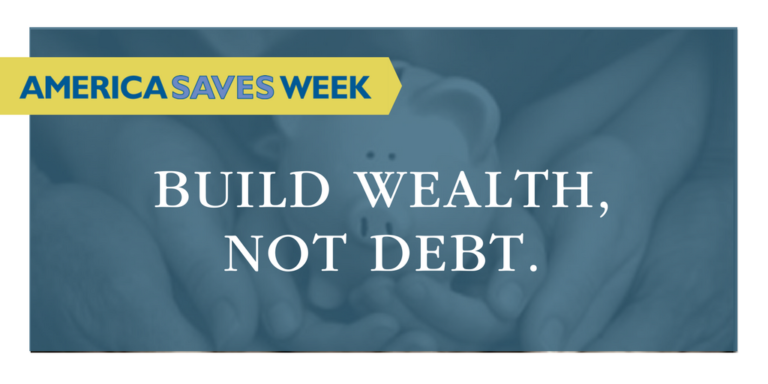 Consider applying the same concept to how we view the idea of money and more specifically saving. As individuals, we have an opportunity to decide how we choose to spend our income. One of the key things to identify and have a self-awareness about is related to our mindset around money and savings. Take an opportunity to think about your existing relationship and mindset around money and savings. What are your thoughts around savings? Do you cringe when you have to think about saving or do you view it as a means to create the future and accomplish your goals? Let's say you have a savings account, and you deposit money when it comes to your mind. However, the number of times you deposit funds in that account are not as frequent. How has your current strategy assisted or hindered you in building a savings account for a rainy day, vacation or other significant things in life? What if I told you there’s another more efficient and effective way to increase your savings and eliminate the stress of going to the bank to make a deposit in a savings account? Through P.E.A.C.E. (purposeful, energetic actions which create empowerment); you can create a new mindset around saving for the future by leveraging automatic savings. Let’s take a look at some of the benefits of automatic savings. The first benefit is peace of mind, the joy of knowing that you have a plan in place to assist you in securing a stable future. Secondly, the ability to keep finances separate. Saving automatically is the opportunity to have separate funds from your operating account and ensures the savings account is set aside strictly for the intended purpose. Lastly, another benefit to automatic savings is the flexibility of being able to designate a selected sum of money to a savings account of your choice. Now that you are excited about the benefits of automatic savings, let’s discuss four tips to get started! Research Banks and Credit Unions: Conduct research of banks and credit unions to determine the best place to open a savings account. As you do your research, ensure there is federal deposit insurance available. The great thing to remember is the bank or credit union does not have to be local. Consider selecting a bank or credit union different from your normal banking relationships and if you want to be bold, decline the option to get an ATM Card. After all, this is a savings account, not your standard operating account. How Much to Save: Take some time to think about the purpose of the savings account and if you need to set aside a particular sum within a specific timeframe. Allow this thought process to guide your decision to determine the dollar amount for your automatic savings. Time to Automate: Go online or contact your employer’s Payroll department to create a financial allotment to go directly to your new savings. At a minimum to get this started, you will need your account number and the bank or credit union deposit information. The key word is “automation.” Remember, out of sight out of mind. Reap the Rewards: Sit back, relax and allow the automation process to lead you to financial peace. Can you hear me now…Cha-ching….Cha-ching! Join us January 30th at the Zaxby's located at 1347 Church Street Ext NW in Marietta for dinner! A portion of the proceeds will benefit community programs! Event Rescheduled: Are you a member of Alpha Kappa Alpha in Search of a Chapter Home??? 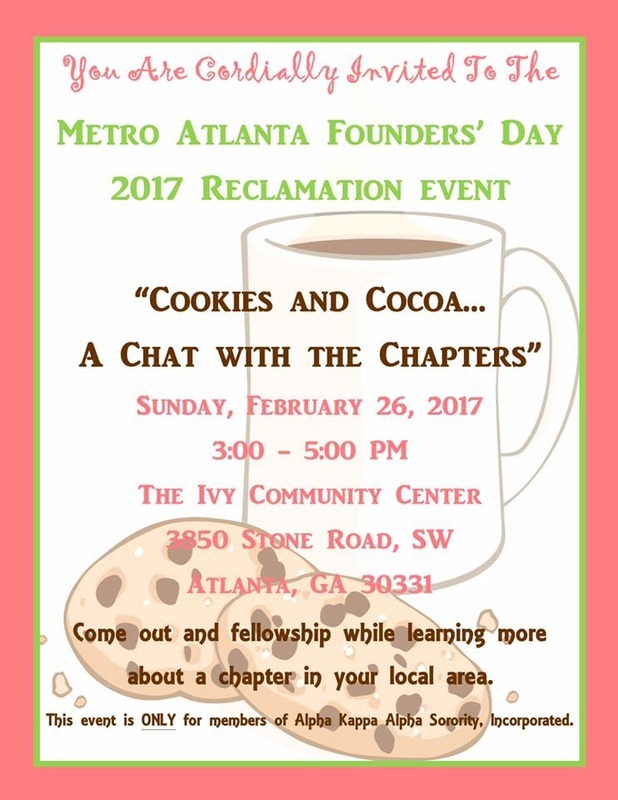 Here is your chance to come out and learn about all of the Metro Atlanta Chapters and find the one that's right for you! 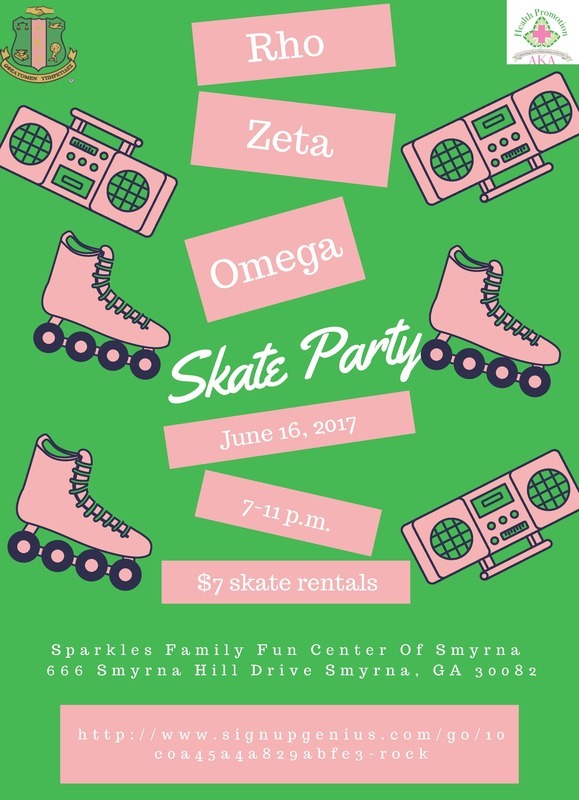 This event is only for members of Alpha Kappa Alpha Sorority, Inc.
Be sure to bring your membership credentials for entry and please stop by the Rho Zeta Omega table to meet us. "Membership makes us SMILE" so we hope to see you there! Thank You Harrison High School! Thank you to the Harrison High School fine arts department for donating the proceeds of their upcoming "Salute to the Cotton Club" production to the P.E.A.R.L. Foundation. Members of Alpha Kappa Alpha and friends will be in attendance to experience this awesome production. For ticket information, email marie.bruner@cobbk12.org. This event is sure to sell out! Thank you again for your support. 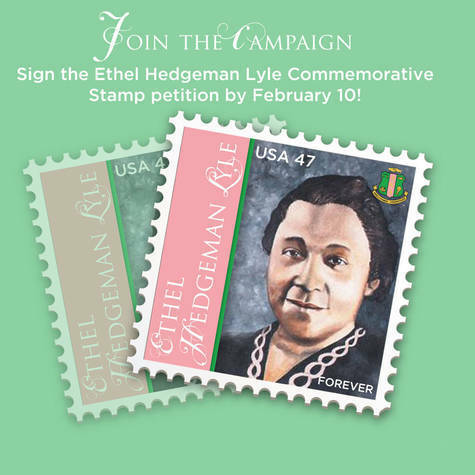 It's been a long tradition for the women of Alpha Kappa Alpha Sorority, Incorporated to wear the colors pink and green. On National Wear Red Day®, Friday, February 3, 2017, Alpha Kappa Alpha will join millions of Americans in the fight against heart disease in women by wearing RED! Heart disease is still the No. 1 killer of women, taking the life of one in three women each year. This is especially important for African-American women; who are at increased risk due to factors such as high blood pressure, high cholesterol, obesity and diabetes. Participants can download the flyer for each event to access the sign-up link. 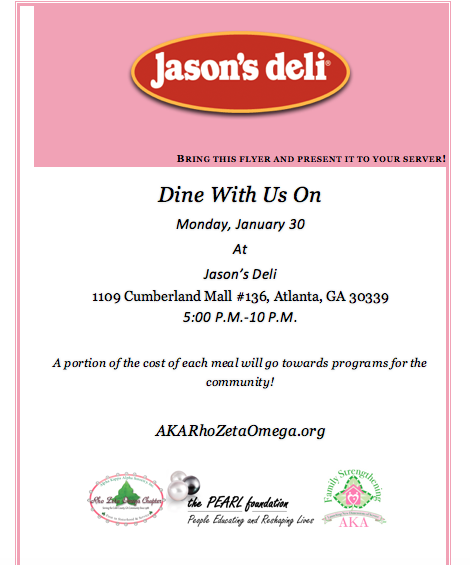 Join us January 30th at Jason's Deli Cumberland Mall for dinner! Alpha Kappa Alpha Sorority, Inc., founded in 1908 as the first African-American Greek-letter sorority, promotes high scholastic and ethical standards. 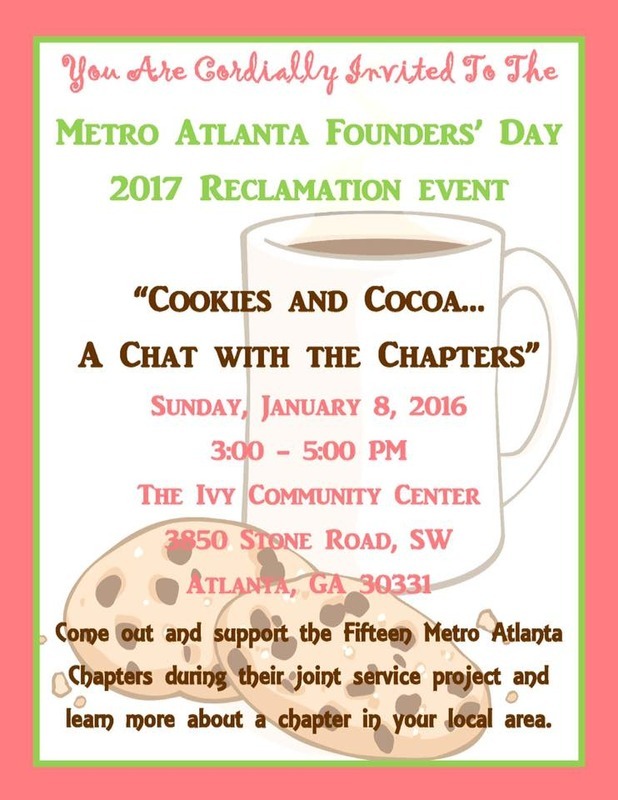 Since 1988, the North Suburban Atlanta Chapter, Rho Zeta Omega, has actively supported the community through various service projects. One of our annual projects includes awarding college scholarships to talented area students. All applications and supporting materials must be uploaded by midnight on Monday, February 20, 2017, NO EXCEPTIONS! A KING “DAY ON” for HEALTH and CHILDHOOD HUNGER AWARENESS! and walk in the annual Cobb County MLK Day parade. Join us as we walk a modest 1.5 miles, for better HEALTH on King Day! FAMILY STRENGTHENING and CHILDHOOD HUNGER AWARENESS. It's going to be a great "DAY ON!" Due to the threat of inclement weather, the service project and reclamation activity are being rescheduled. Stay tuned for a new date and time in the very near future. Thank you again for your support and we look forward to seeing you soon! Please drive carefully and stay warm! Are you an AKA Member in Search of a Chapter Home? 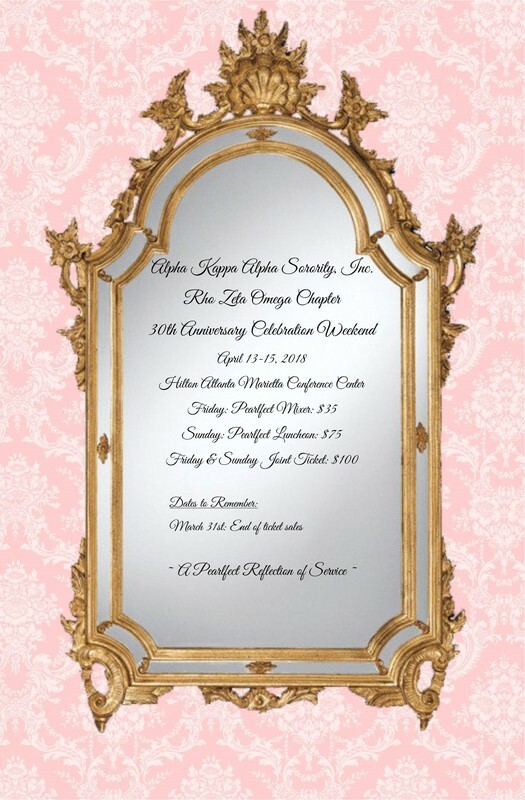 Be sure to bring your membership credentials for entry and please stop by the Rho Zeta Omega table to meet us. "Membership makes us SMILE" so we hope to see you there! Thanks to everyone who came out to participate in Alpha Kappa Alpha Sorority, Inc. - Rho Zeta Omega Chapter, first 5K Race with over 500 participants - Dashing Through The Square 5K Race/Walk - 2016. We truly appreciate your participation and support of this fundraising effort to support scholarships and community service projects. A special thank you to all the sponsors, the City of Marietta personnel, Race trackers/facilitators - Orion and to all the members of Rho Zeta Omega Chapter and Fundraising Committee. Be sure to join us again on December 2, 2017. Gloria Nichols, President - PEARL Foundation, Inc.
Gwinnett Dermatology, Jessica Mercer, M.D. Our race is Saturday, December 3, 2016 at Historic Marietta Square. The race begins at 8:08 AM. It’s not too late to register for this family-friendly event. Visit Active.com, search for Dashing Through the Square and register today!! What are you doing on Saturday, 10/29? 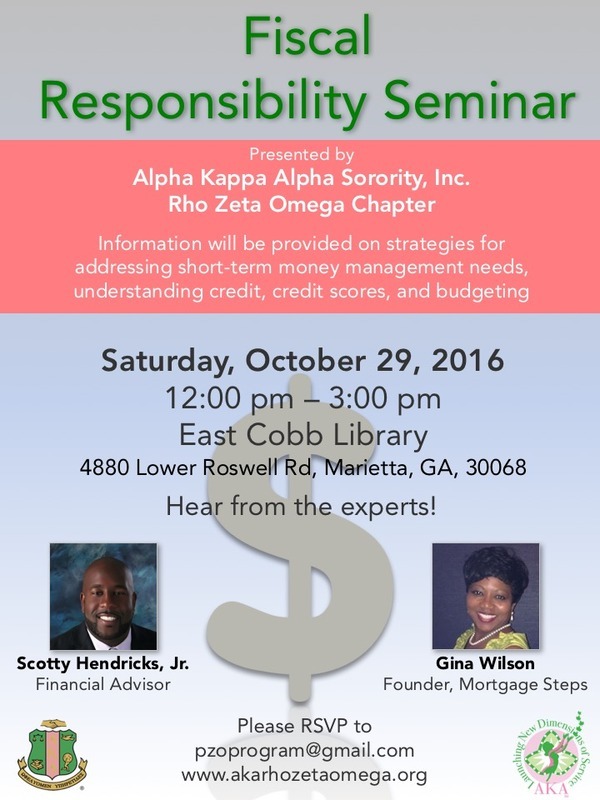 We want you to join us for our "Fiscal Responsibility Seminar" where you'll hear from financial experts! 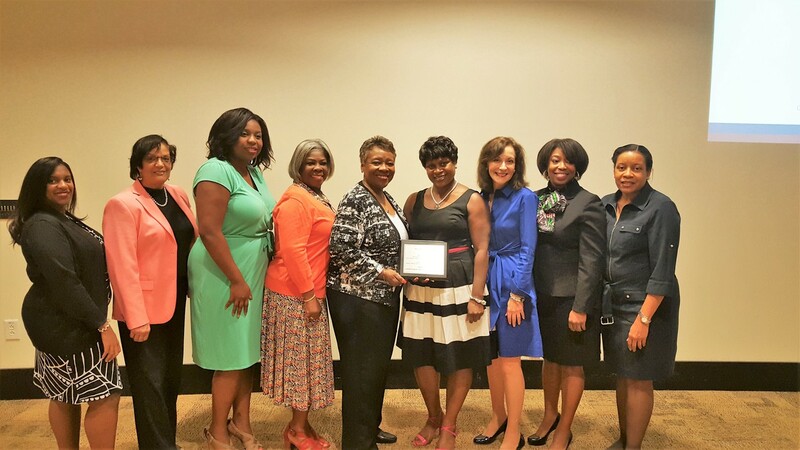 Alpha Kappa Alpha Sorority, Inc., Rho Zeta Omega Chapter and the PEARL Foundation, Inc. was recognized by the Cobb Chamber of Commerce as it's 2016 Partner in Educatioin for its donation of time and service in supporting the students of Marietta and the community. Rho Zeta Omega and The PEARL Foundation, Inc. were both recognized for over 20 years of dedicated service to the community, in addition to the service project at Park Street Elementary School. This is the second time that the two organizations have recevied this honor and was also inducted into the Cobb Chamber of Commerce Hall of Fame. This year's event includes a 5K, a Virtual 5K and the 1K Rudolph Run. The race is a Peachtree Qualifying Race and features electronic chip timing to ensure accuracy for all runners. This family friendly race will take you past beautiful, historic homes and the quaint shops that line Marietta Square. Proceeds from this event will support youth enrichment programs and other community initiatives benefiting Cobb County. 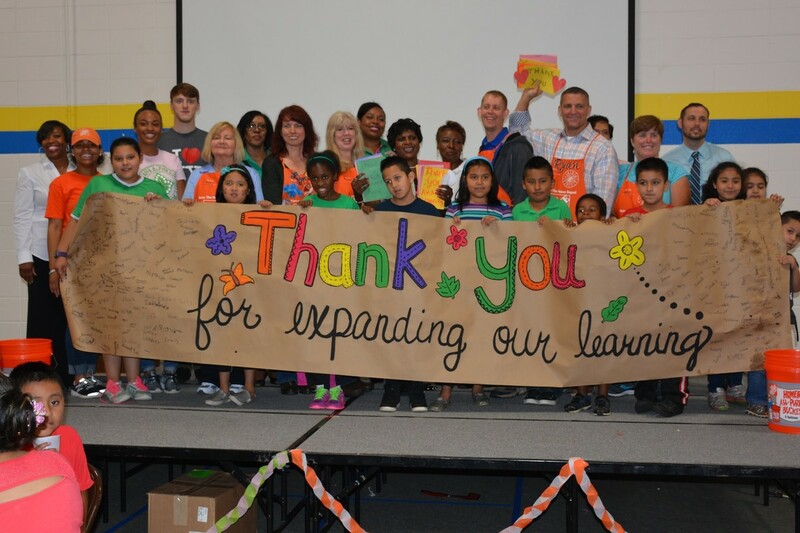 Rho Zeta Omega Chapter and The Home Depot, have restored playground equipment and a built a new outdoor classroom to enjoy next school year at Park Street Elementary School, in Marietta, GA. The Rho Zeta Omega Chapter of the Alpha Kappa Alpha Sorority is helping restore playgrounds in Cobb County as part of the International Sorority’s 1908 Playground Project initiative, to restore 1,908 playgrounds across the country in four years. Doing its part in the initiative, Rho Zeta Omega Chapter restored a playground for the Motivation, Dedication and Excellence School, M.D.E. School, in east Cobb last year. In addition to the playground, The Home Depot and Rho Zeta Omega Chapter are also creating a therapy garden. Freedman said Park Street has a number of students with special needs who will enjoy the garden. Freedman said a few minor details such as staining the outdoor classroom still need to be completed before the project is complete, but it will be ready soon. “It would have taken us definitely a lot longer for us to do this without their support,” he said. Rho Zeta Omega Chapter is a Partner in Education with both Park Street Elementary School and Lockheed Elementary School through the Cobb County Chamber of Commerce. 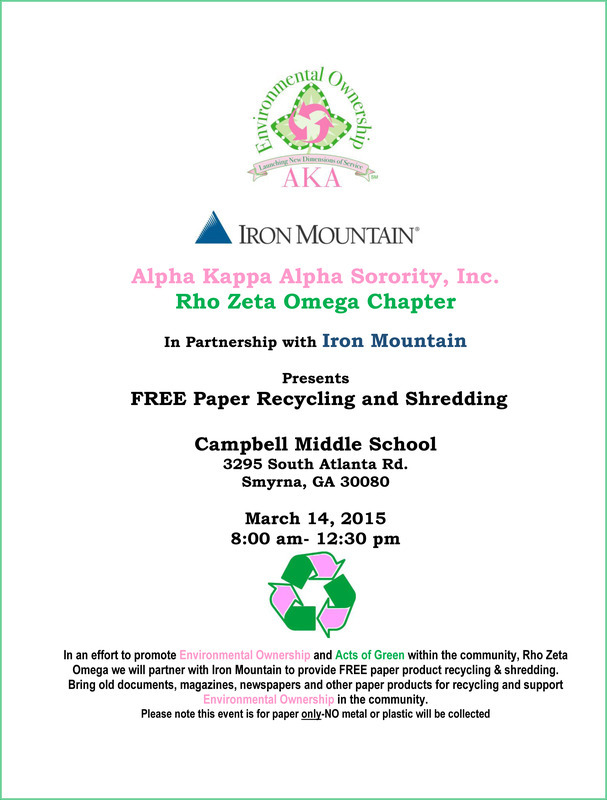 August MCS Angels - The Rho Zeta Omega Chapter of the Alpha Kappa Alpha Sorority, Inc. and the PEARL Foundation, Inc. Many Thanks to our August MCS Angels - The Rho Zeta Omega Chapter of the Alpha Kappa Alpha Sorority, Inc. and the PEARL Foundation, Inc. 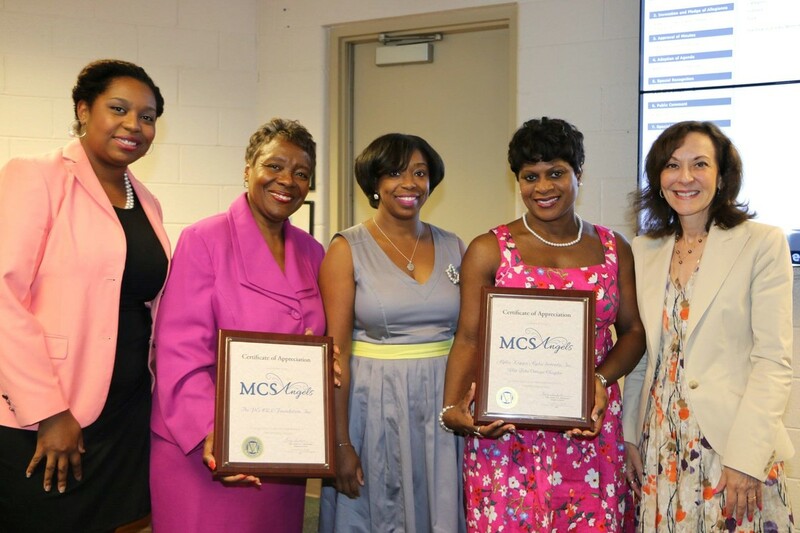 The Rho Zeta Omega Chapter of the Alpha Kappa Alpha Sorority, Inc. and the PEARL Foundation, Inc. are valued Partners in Education dedicated to the advancement of MCS students for 20+ years. In this time, they have facilitated Kids Club After School programs that focused on fiscal management – with snacks and transportation provided; sponsored and supported Honor’s Day presentations and parent receptions, Math Fairs, and 100 Day Club Celebrations; planned Asthma Prevention and Management Community Fairs; donated funds for uniform purchases for students in need and principal challenge activities; promoted healthy diet and living; provided backpacks with school supplies annually and mentorship opportunities for young ladies. AKA also annually gives scholarships to MHS students. Most recently, this past summer, AKA and the PEARL Foundation completed a service project at Park Street ES which was part of the 1908 Playground Mobilization Community Impact Project. They worked in conjunction with Home Depot and built an outdoor classroom and sensory garden at Park Street. In addition, AKA donated supplies for Park Street’s new STEM LAB and facilitated the Playground Mobilization Community Impact Day. Their service to MCS has also awarded them as a Cobb Chamber of Commerce 2016 Outstanding Partner in Education and induction into the Partner in Education Hall of Fame. Their generosity and commitment to our students is unsurpassed. The ASCEND program, is Alpha Kappa Alpha Sorority, signature youth enrichment program. The program is designed to motivate, engage and assist high school students in reaching their maximum potential. Its focus is on Achievement, Self-Awareness, Communication, Engagement, Networking, and Developmental Skills (A.S.C.E.N.D.). The participants in ASCEND will have an opportunity to receive academic enrichment and life skills training to support their journey to college or vocational employment.  -Submit most recent report card. All interested applicants should submit the application with other requirements, no later than June 18, 2016 to the address below. Applicants will be contacted following the review process. Would you like to save money and help the environment too? Please join the Rho Zeta Omega Environmental Ownership committee, Home Depot and Georgia Power for a hands-on and interactive energy efficiency seminar October 22, 2015, 6-8pm at Home Depot in Austell. There will be prizes up to $250 in value, music, refreshments and a lot of great tips on how to lower your electric bills. What are you doing on Saturday, 9/19? 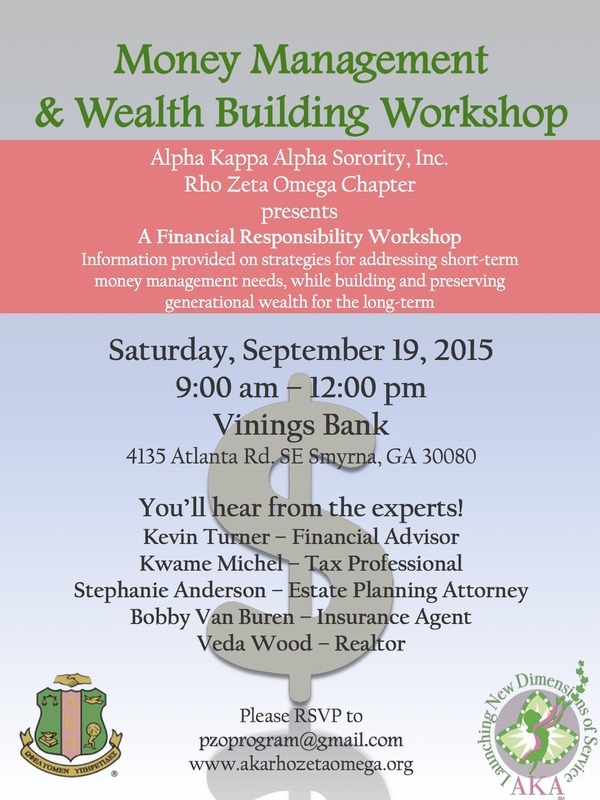 We want you to join us for our "Money Management & Wealth Building Workshop" where you'll hear from financial experts! 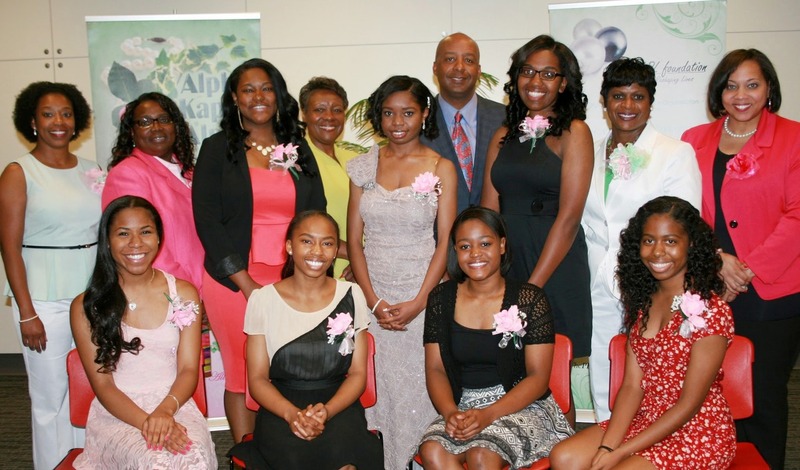 Alpha Kappa Alpha Sorority, Inc., Rho Zeta Omega Chapter and The PEARL Foundation, Inc., awarded over $10,000 in scholarships to 13 deserving high school female students from Cobb County. The recipients are among the county’s brightest and most promising students. Numerous students from Cobb County applied for the scholarships and were interviewed by representatives of both organizations. Of the candidates that advanced to the final round, 13 students were chosen from the high schools indicated below. Gloria Nichols is the President of The PEARL Foundation, Inc. The recipients were selected based on financial need, scholarship interviews, letters of recommendation, and academic accomplishments. They will continue their quest to attain scholarship achievement through higher education at schools such as Emory University, Howard University, University of Pennsylvania, and the University of Alabama. The candidates received varying amounts of between $500 and $2,000. A scholarship reception was held on Saturday, May 2 Zion Baptist Church to recognize the students for their accomplishments. Members of the Cobb County School Board and Marietta City School Board were in attendance, including Randy Scamihorn, Cobb County School District Board Chair. The scholarship awards and reception are annual events to encourage academic achievement and continued education in our local community. 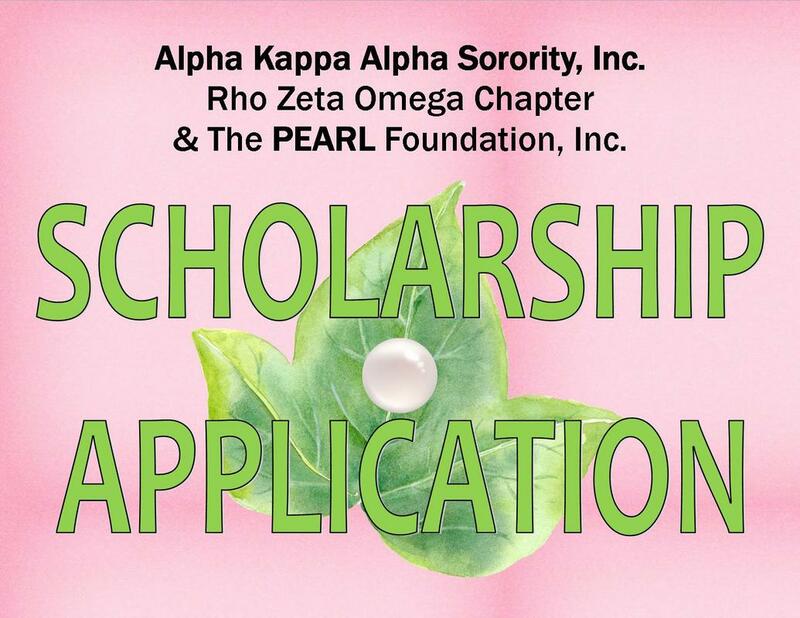 Rho Zeta Omega Chapter of Alpha Kappa Alpha, Sorority Inc., is accepting applications to its ASCENDprogram for high school students living and attending school in Cobb County. 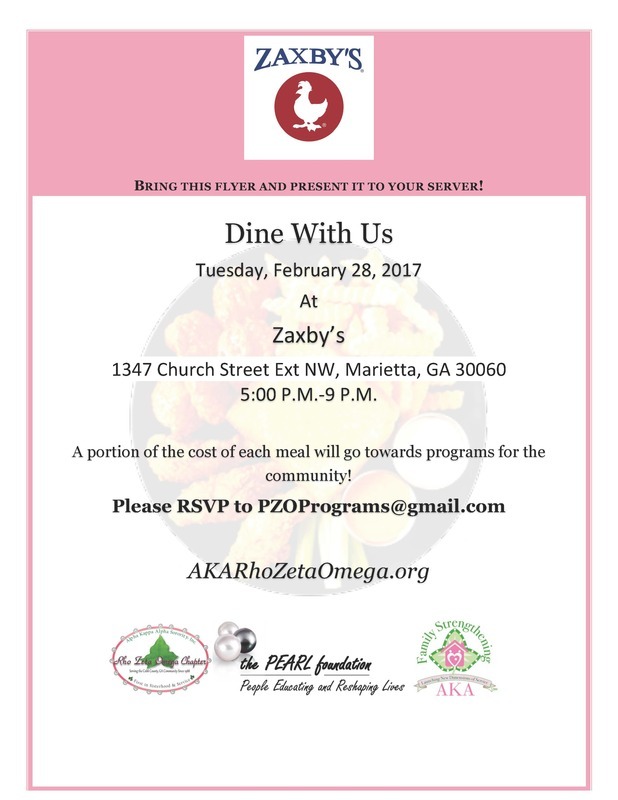 Rho Zeta Omega Chapter of Alpha Kappa Alpha, Sorority Inc., is accepting applications to its ASCEND℠program for high school students living and attending school in Cobb County. The ASCEND program is Alpha Kappa Alpha Sorority, new signature youth enrichment program. The program is designed to motivate, engage and assist high school students in reaching their maximum potential. Its focus is on Achievement, Self-Awareness, Communication, Engagement, Networking, and Developmental Skills. The participants in ASCEND will have an opportunity to receive academic enrichment and life skills training to support their journey to college or vocational employment. Submit most recent report card. All interested applicants should submit the application with other requirements no later than May 20, 2015 to the address below. Applicants will be contacted following the review process. 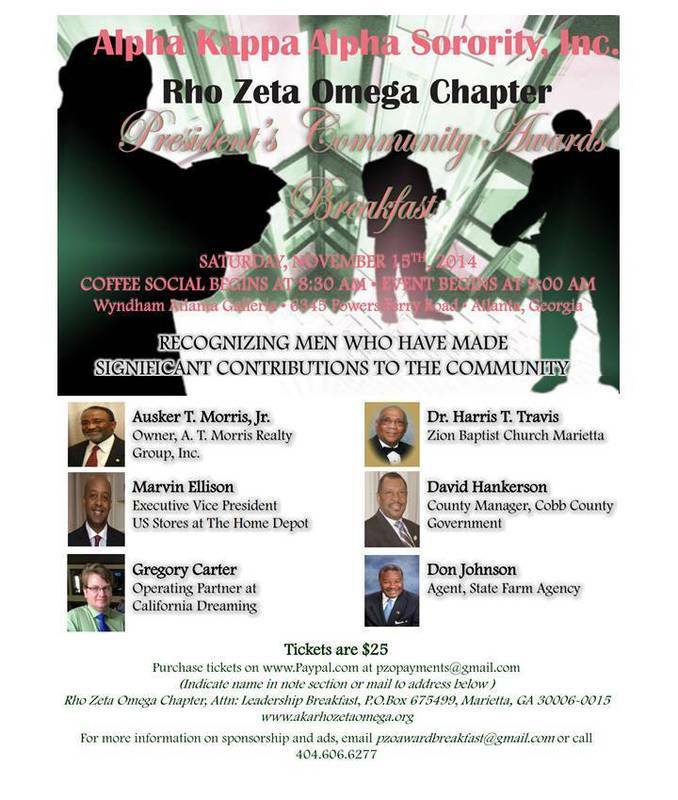 On Saturday, November 15, 2014, Rho Zeta Omega Chapter of Alpha Kappa Alpha Sorority, Inc. will honor six men who have made significant contributions to Cobb County and the North Atlanta communities. These leaders have impacted the local community by investing their times, talents, and treasures. Recipients are from a variety of backgrounds and continuously demonstrate their commitment to being of service. The event is open to the public and will take place at 8:30 AM at the Wyndham Atlanta Galleria Hotel, Powers Ferry Road, in Atlanta, Georgia. Individual tickets are $25 (or table of 10 for $250). Tickets can be purchased on PayPal at pzopayments@gmail.com. Sponsorship opportunities are also available. Karen Greer of 11Alive will serve as Mistress of Ceremonies. The Business Owner Recipient is Mr. Ausker T. Morris Jr., of the A. T. Morris Realty Group, Inc., Mr. Morris often teaches home buying seminars to help first time buyers understand the process, with the ultimate goal of achieving home ownership and lending his assistance and advice for various senior programs in Cobb County and others through Omega Psi Phi Fraternity, Inc. The Clergy Recipient, Dr. Harris T. Travis has been the Senior Pastor at Zion Baptist Church, Marietta for the past 22 years, leading more than 35 Associate Ministers that serve the church and community. He has been very active in the community through his ministry and giving through various auxiliaries designed to help those in need, be it homelessness, alcoholism/drug addiction, clothing, food or just a word of prayer. He also contributes his service through his fraternity, Alpha Phi Alpha Fraternity, Inc. The Corporate / Executive Recipient is Mr. Marvin Ellison, Executive Vice President., US Stores at The Home Depot. Mr. Ellison is the first African-American in Home Depot’s executive suites in the company’s history. As one of six executive vice presidents, Mr. Ellison is in charge of nearly 2,000 stores in the United States, Puerto Rico, Guam, and the U.S. Virgin Islands. Mr. Ellison and The Home Deport have provided scholarships for various Cobb County students through Rho Zeta Omega’s scholarship program with the Pearl Foundation, Inc. and has been a partner of Rho Zeta Omega in various other capacities over the years. The Government Official Recipient is Mr. David Hankerson, who currently serves as County Manager for the Cobb County Government. During his tenure, the country has remained financially stable, even during the midst of economic downturn throughout the state and country. Under Mr. Hankerson’s leadership, Cobb County moved from a rural community to its present urban county and led the way in building new libraries, park facilities, senior centers, and court system buildings. Mr. Hankerson is active in various community projects in the Cobb County area. The Community Volunteer Recipient is Mr. Gregory Carter, who has been the Operating Partner at California Dreaming in Kennesaw for more than 5 years. Mr. Carter actively sponsors annual Cobb County community initiatives, like the MLK Day Celebration and the California Dreaming Bowl which generates funds for the athletic programs at Sprayberry High School and Kennesaw Mountain High School and the Toys for Tots program. Don Johnson, State Farm Agent, will receive the President’s Award because of his various leadership roles in the community, ranging from the Cobb Chamber of Commerce, Cobb Boys and Girls Clubs, and The United Way to name a few. This successful entrepreneur is a constant advocate for education and social awareness. Mr. Don Johnson has also been a constant and consistent supporter of Rho Zeta Omega with its community projects and fundraising efforts for more than 24 years. Rho Zeta Omega Chapter of Alpha Kappa Alpha Sorority, Inc. congratulates all of our honorees and appreciates their continued support and commitment to investing in Cobb County and other communities. 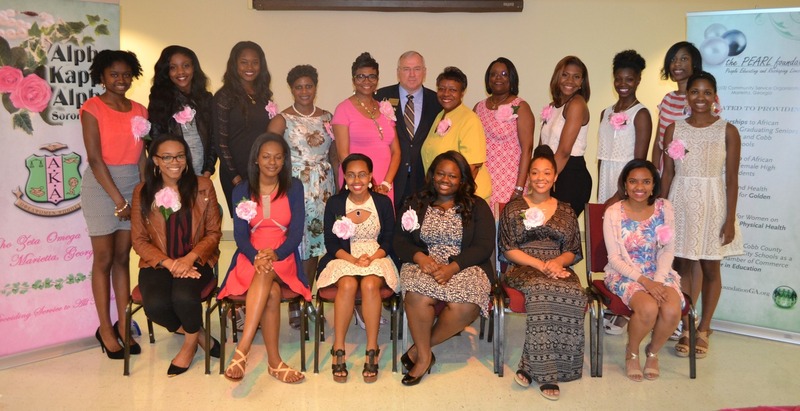 Rho Zeta Omega Chapter of Alpha Kappa Alpha Sorority, Inc. and the Pearl Foundation, Inc. awarded scholarships to nine deserving high schools students from Cobb County. The recipients are among the county’s brightest and most promising students. Numerous students from Cobb County applied for the scholarships and were interviewed by representatives of both organizations. Of the candidates that advanced to the final round, nine students were chosen. The scholarship recipients include: Bria Edwards (Pebblebrook HS), Andrea Evans (Campbell HS), Isatta Feika (Pebblebrook HS), Jazmine Griffin (Kennesaw Mountain HS), Terrylin Kinard (Campbell HS), Renee Metelus (Campbell HS), Anika Mitchell (Campbell HS), Kesiena Ubidi (Kennesaw Mountain HS), and Raigon Wilson (Marietta HS). These students are leaders in their respective schools. Their participation in student organizations and distinguished honors, such as Outstanding Seniors, Who’s Who among American High School Students, and Commencement Speakers, truly make them the best selections to receive the financial assistance for their college careers. All of the recipients will begin their first semester of four-year colleges and universities in Fall 2014 to include the University of Georgia, the University of North Carolina­-Chapel Hill, Boston University, Cornell University, and others.The candidates received scholarships in varying amounts between $500 and $2500 each. The reception took place at the Home Depot Support Center in Atlanta, Georgia. Mr. Marvin Ellison, Executive Vice President – U.S. Store of the Home Depot, was the keynote speaker for the event. Mr. Ellison drew from his personal college experiences to share the importance of education. “College is for an education – not a social experience. Make your parents proud. You owe them that,” Mr. Ellison shared to the graduating seniors. The Home Depot, along with Publix Supermarkets, State Farm Insurance, and California Dreaming, are corporate sponsors for this annual scholarship program. The scholarship awards and reception is an annual event to encourage academic achievement and continued education in our local community. 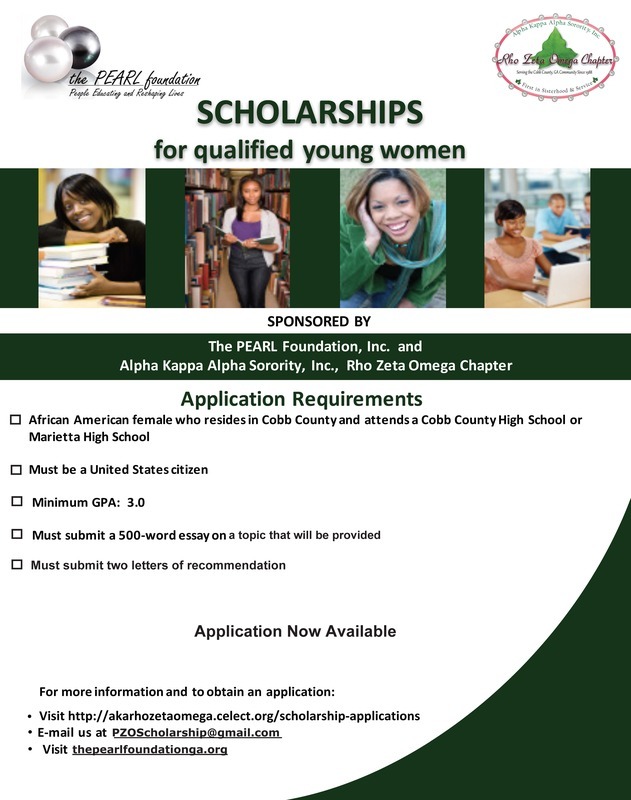 The PEARL Foundation in conjunction with the Rho Zeta Omega Chapter of Alpha Kappa Alpha Sorority, Inc., (Cobb County) will be sponsoring the College Prep Club for female students in grades 9-12 who attend a Cobb County or Marietta City high school. A variety of informative and interesting seminars will be conducted. These seminars focus on the college admissions process, financial aid, college entrance exams and the college experience. The culmination of the program will be a college trip to visit typically a Historically Black College or University. It is expected that students participating in this group attend the College Prep sessions planned by the sorority, complete at least 15 hours of community service over the summer break, participate in a group community service project during the school year and complete other assigned activities throughout the program year. Students interested in applying to become a member of the College Prep Club, must complete the application and return it postmarked by Friday, May 16, 2014. Applications received after the postmark date will not be accepted. for a free CPR training class! you will be sent the link to register for the class.